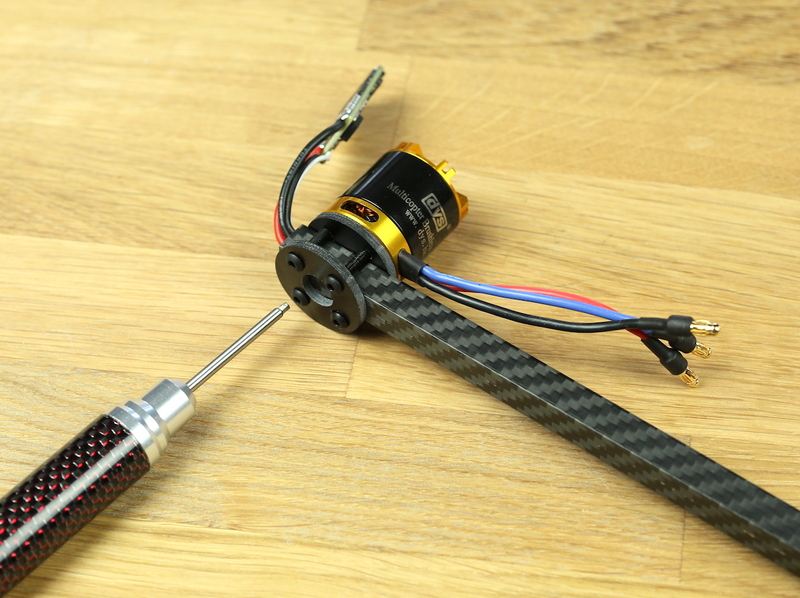 After searching and searching after the perfect tricopter V3 motor I ended up getting custom ones made. 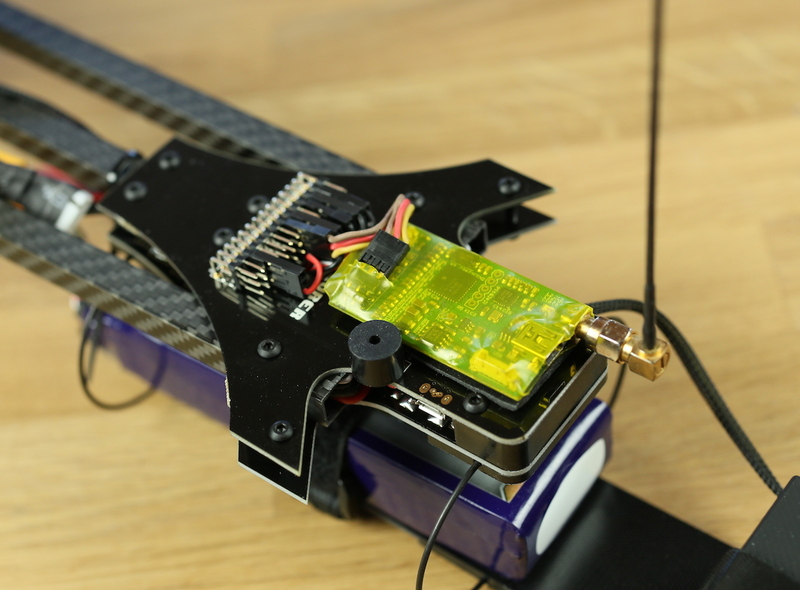 The results on the test bench were spot on! So I decided to build Tricopter V3.5 from scratch with the new electronics and while I’m at it, why not make a build log as well. Start with the camera/battery tray. That way the glue has plenty of time to cure while the rest of the copter is being built. Sand the bottom wire holders with 180 grit paper (or something there about) This is so the glue have more surface area to grab on to and it ensures that the piece is nice and flat. Don’t forget to wipe the piece off after you’ve sanded it. Dust is glues worst enemy. 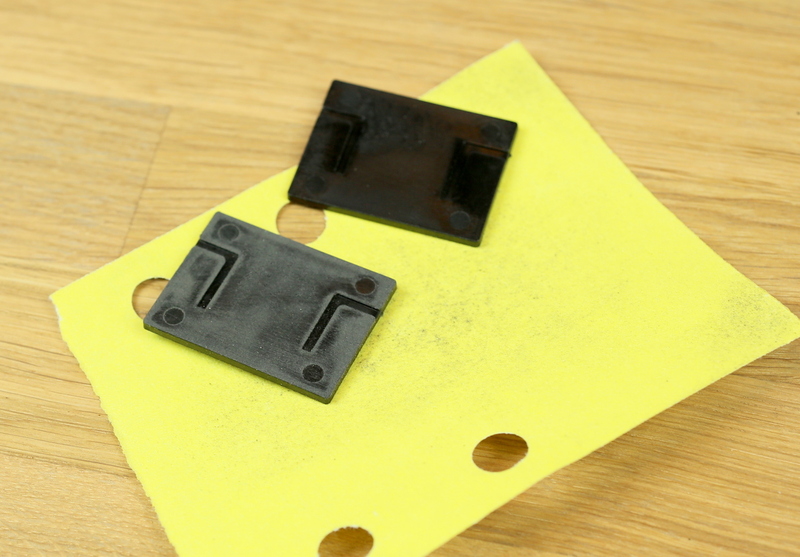 While you’re at it you can also lightly sand the G10 camera tray a bit as well. 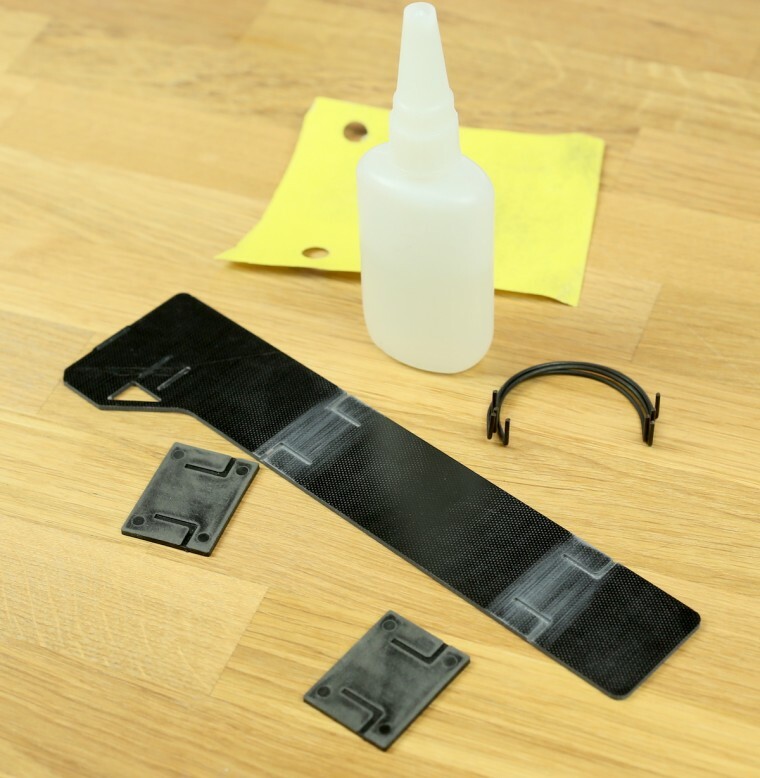 Use medium or thick viscosity CA glue. Add some to the slots where the wires are going to be inserted to ensure they get glue all the way around them. 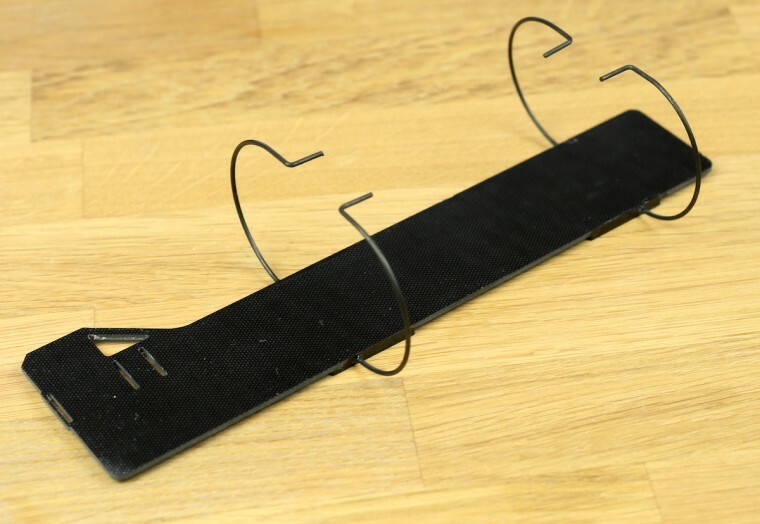 Then add glue to the bottom wire holder. Insert the wires in the slots. 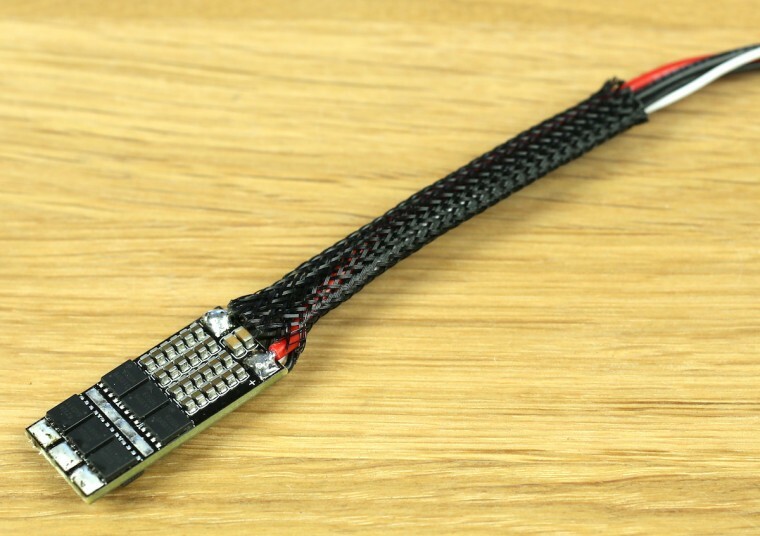 It can be a bit tricky to hold both wires in place at the same time. 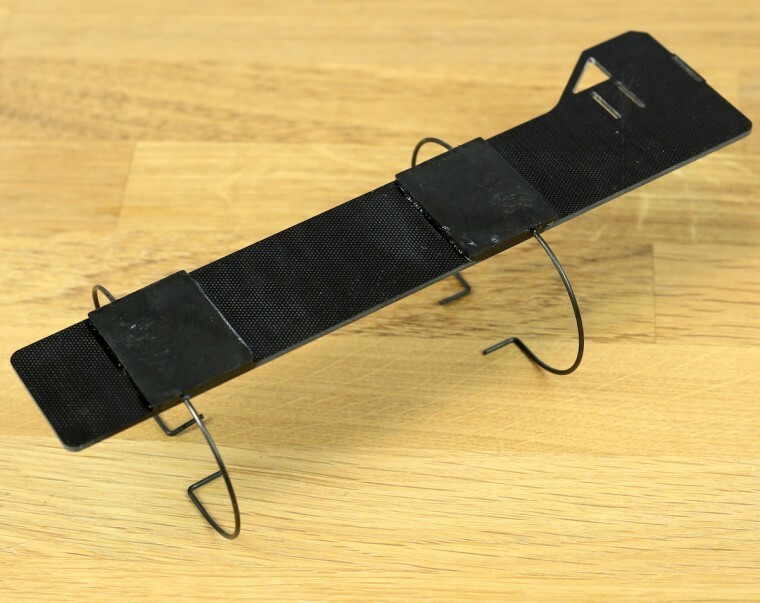 It’s best to be over a surface you don’t mind getting glue on, in case you drop one. 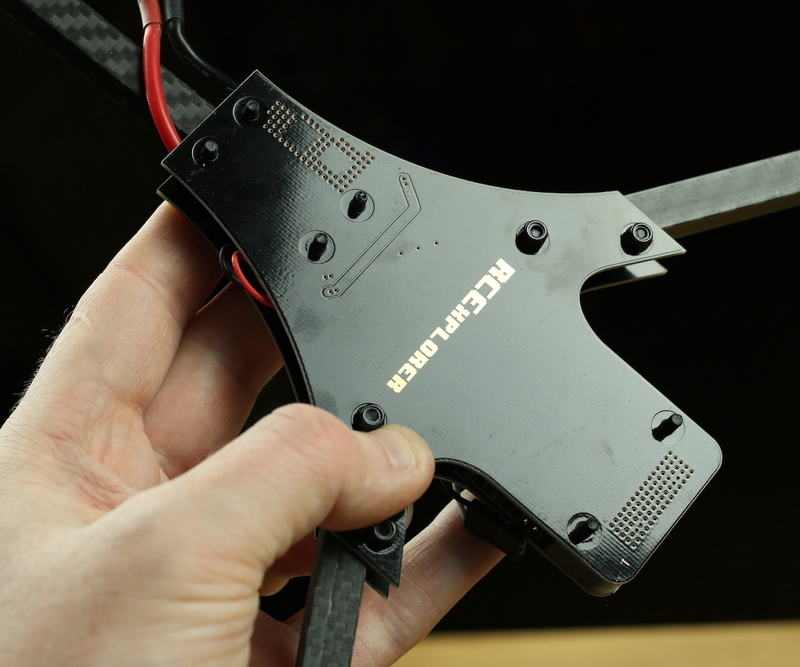 Squeeze the bottom wire holder and the battery tray together. Make sure the surfaces are completely flat against each other and that the wires is still laying in the slots. 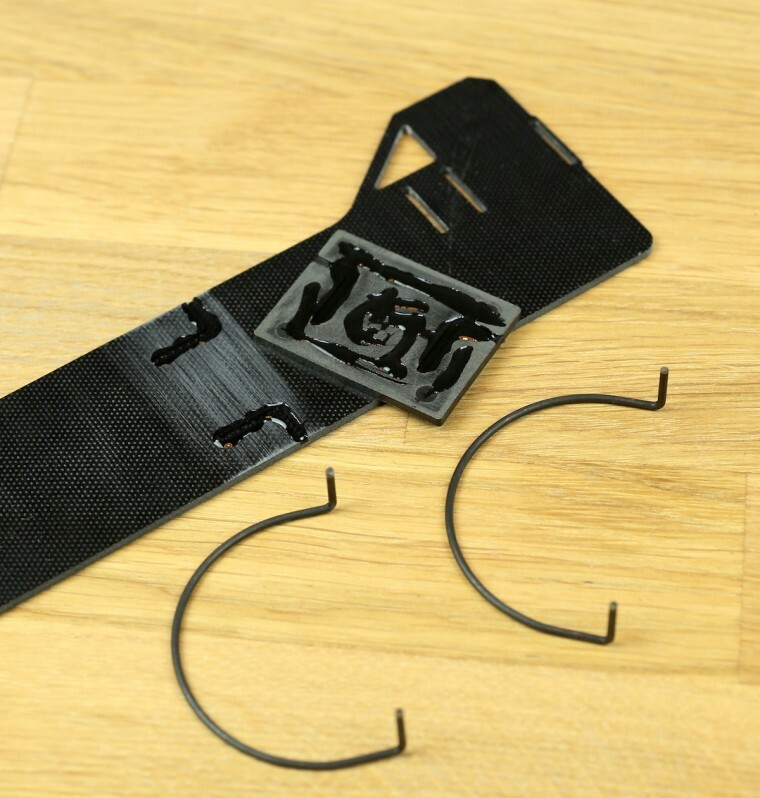 It’s a good idea to use a clamp or two to really squeeze the two pieces together to ensure a really tight fit, it becomes much stronger that way. Have a paper towel or something close by in case glue comes squirting out. Now that’s done you can put it to the side. 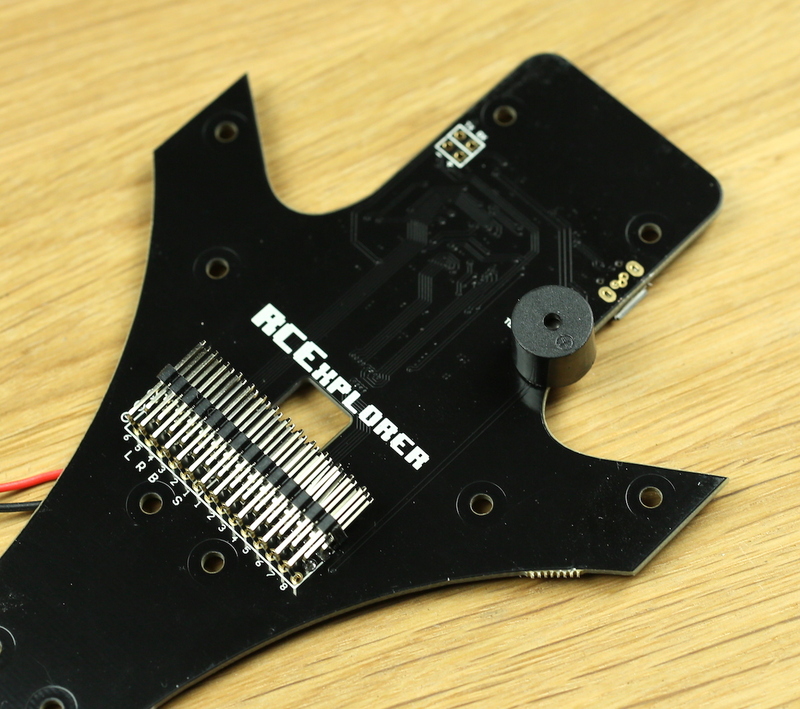 Time to solder on the pinheader to the Naze32 Tricopter frame. I personally use 60/40 0.8mm thich lead based solder. I highly recommend using lead/tin based solder instead of the lead-free kind. It’s a lot easier to get a good result with and it’s actually less harmful to breath in the fumes. 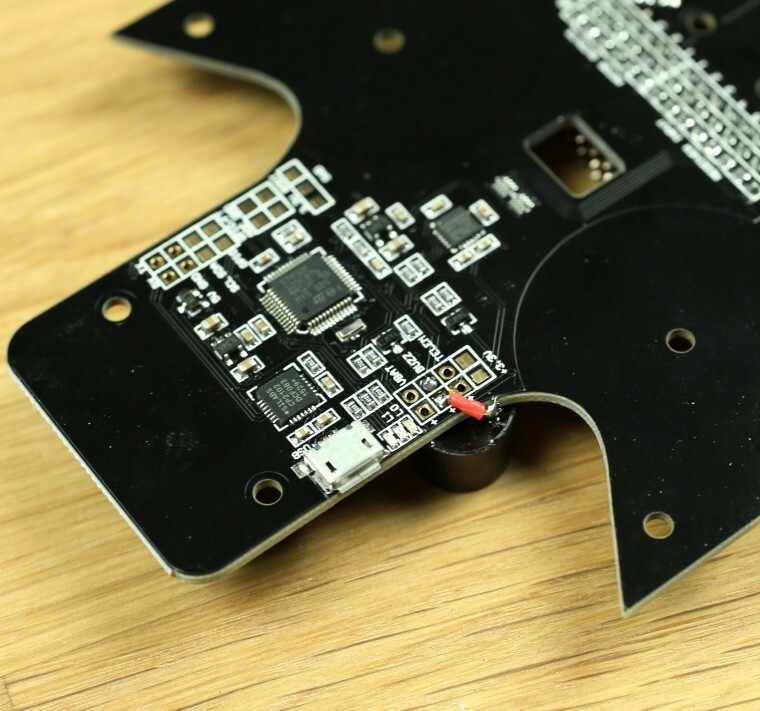 Solder the pinheader at an upwards angle to make it easier to route all the wires through the hole. Roughly this angle is good. 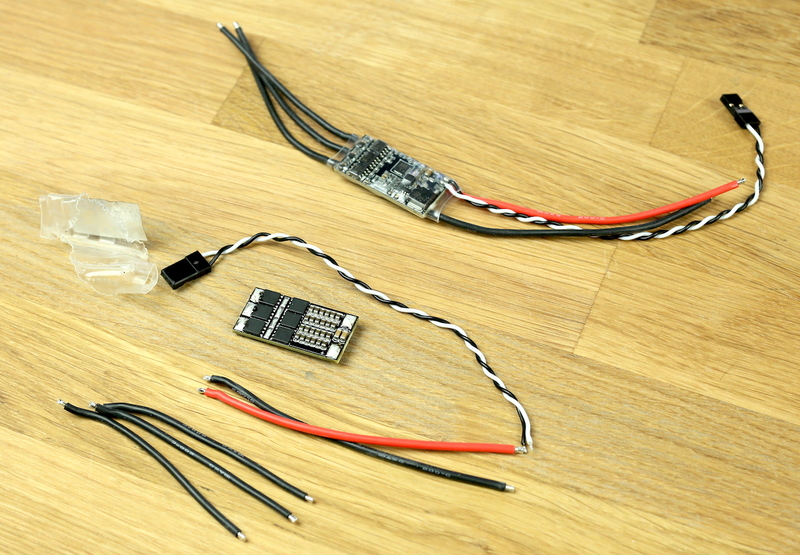 Now we’re going to solder on some longer cables to the ESC’s. 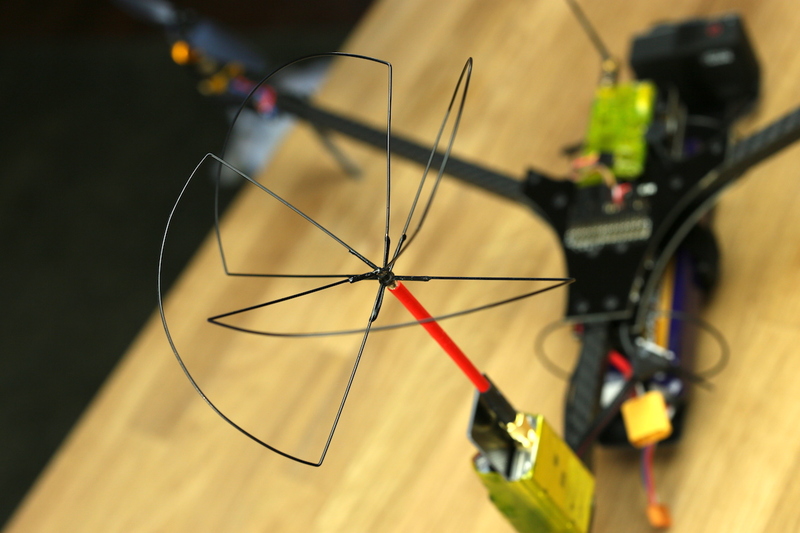 The Tricopter V3.5 needs roughly, precisely 432mm approximate exactly. 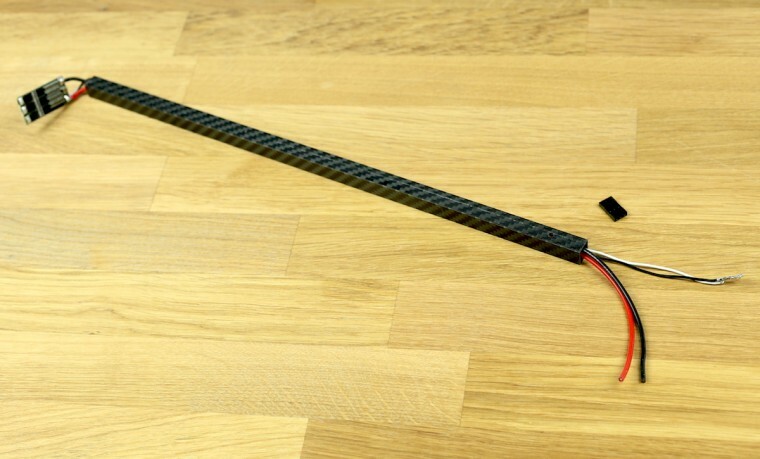 Both the power wires and signal wire should be this length. 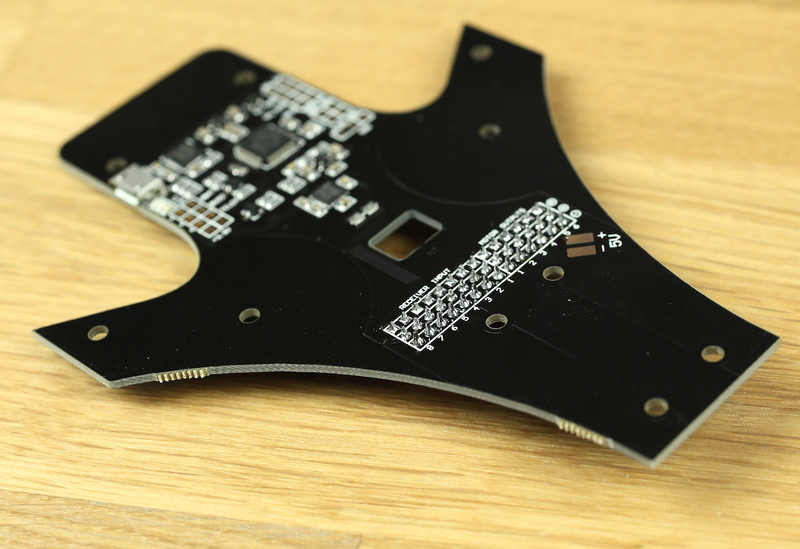 Take note of which pad is which before you desolder the wires. New wires soldered in place. 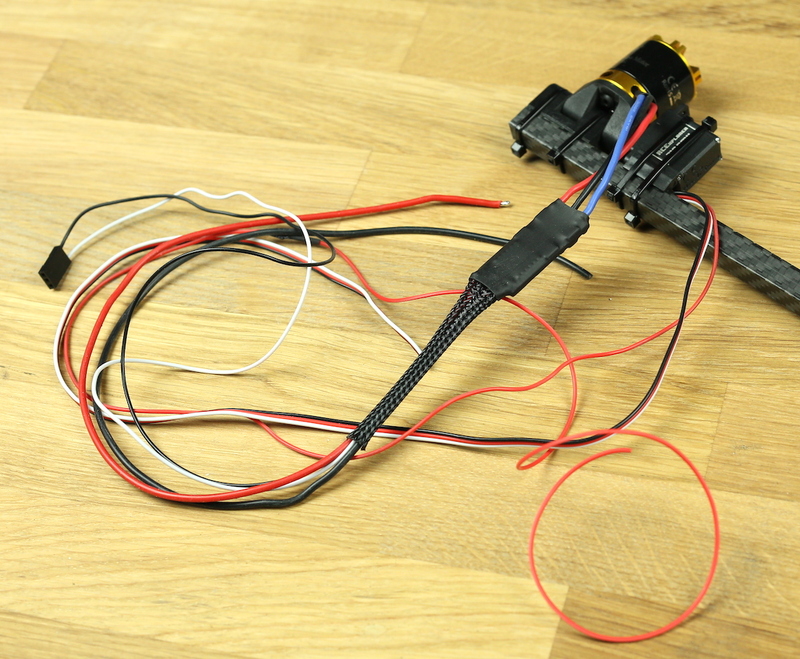 Snaking the wires through the booms is a lot easier if you take out the servo wires out of the servo connector. 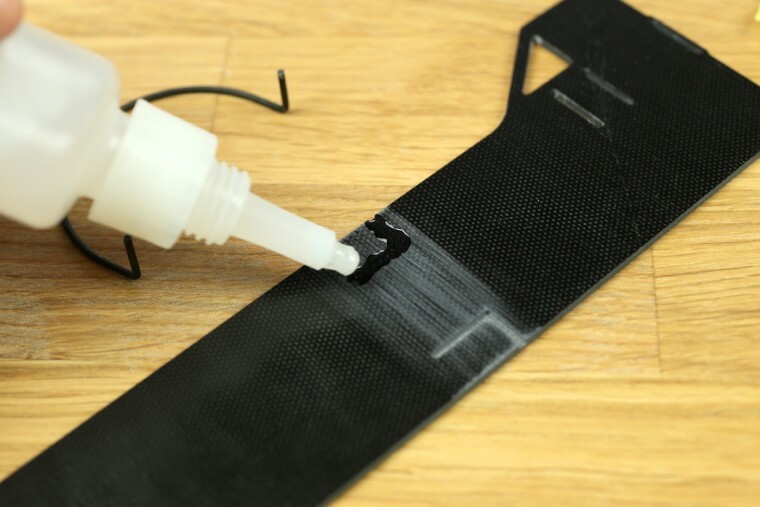 Simply lift the little tab with something thin like an exacto blade and pull the wire out. 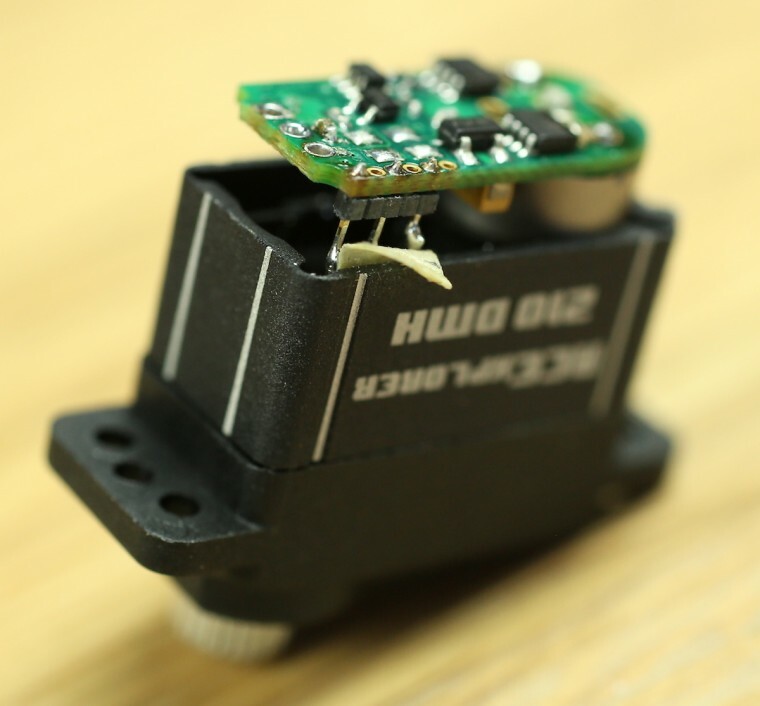 The motors are easily attached using the motor mounts and 18mm long screws. 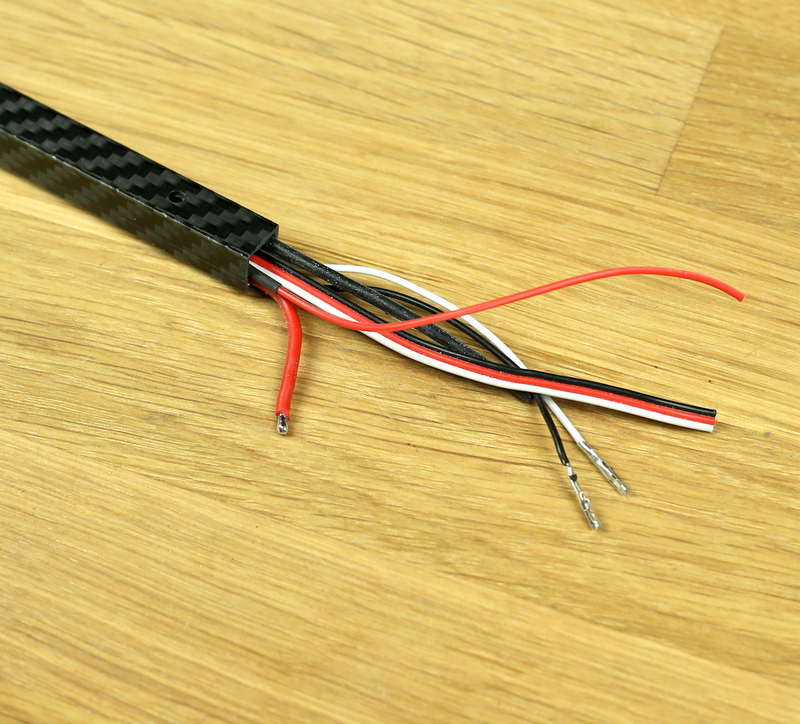 Note which way the motor wires are oriented. 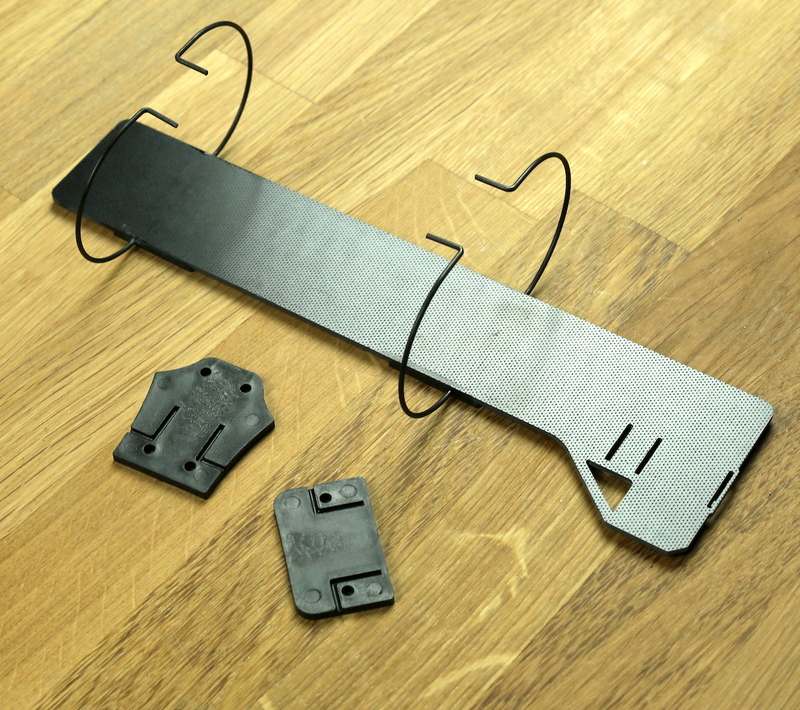 To protect the wiring and improve the looks, 6mm wire mesh can be slid over the power and signal cables. 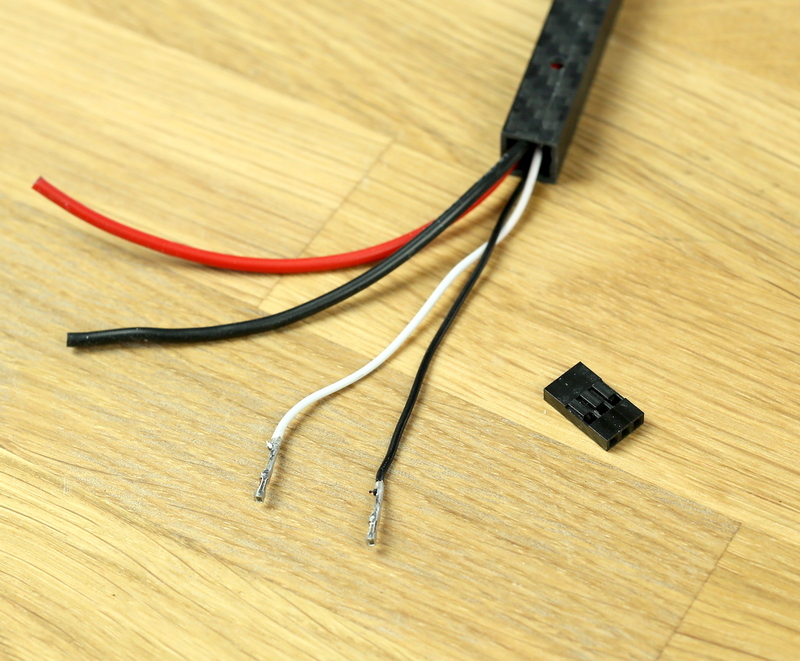 Put on some heatshrink and then solder the motor wires in place. Now to the same to the other arm. 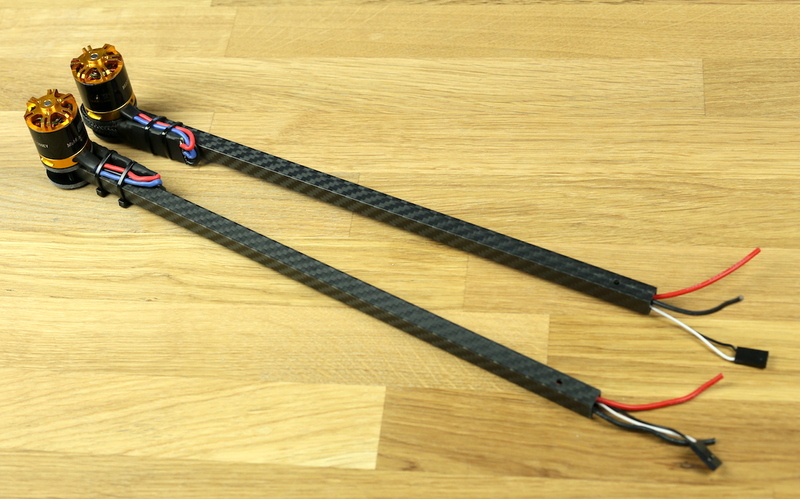 Note that the ESC’s are mounted in opposite directions so that they can face backwards on the copter where they are better protected. Now we’re going to do the back arm. 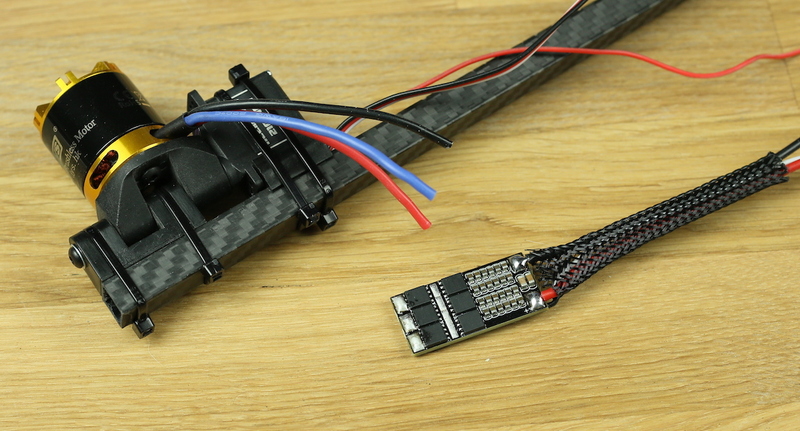 The cable on the servo needs extending and the latest beta of the Triflight firmare supports servo feedback, so we’re going to add a cable for that as well. I opted to remove the signal wires and replace them with longer ones instead of splicing the wire. 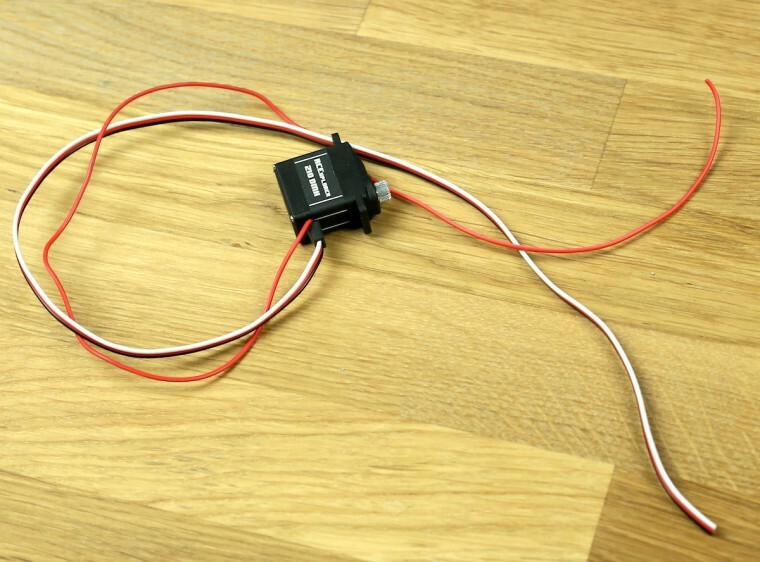 The servo feedback wire is added to the middle pin of the HALL sensor. 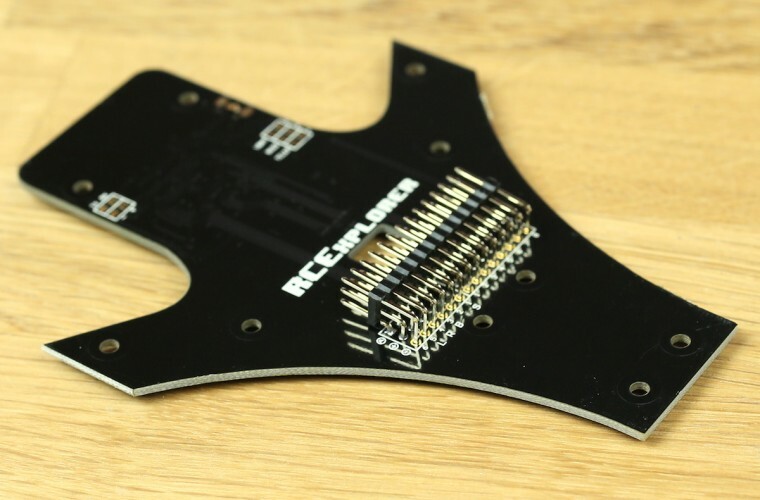 Note how it’s soldered from the back. It’s really hard to close the case otherwise. Soldered the longer servo wire in place. 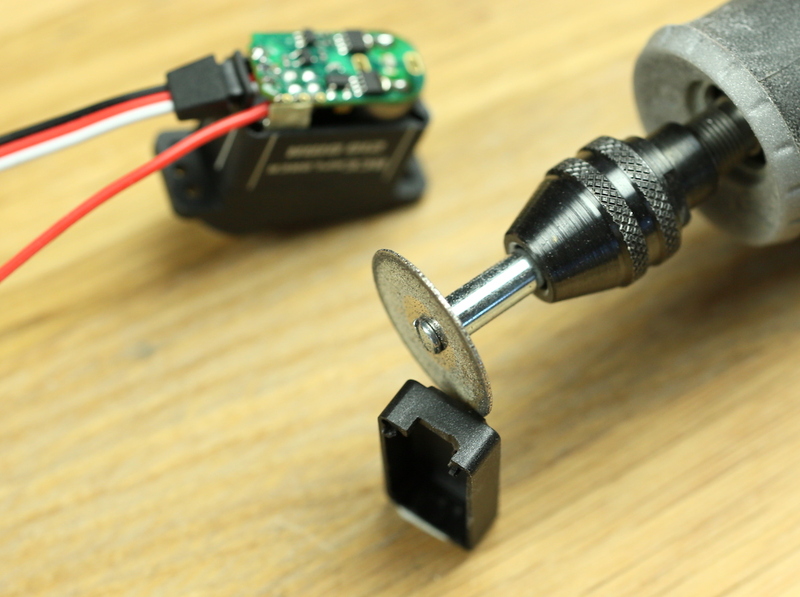 Use a dremel or a small file to make the hole where the servo wire comes out a little larger, so that he feedback wire fits. Now we’re going to do the tilt mechanism. If there is any hint of the tilt having any friction, lightly sand the pieces until it’s buttery smooth. 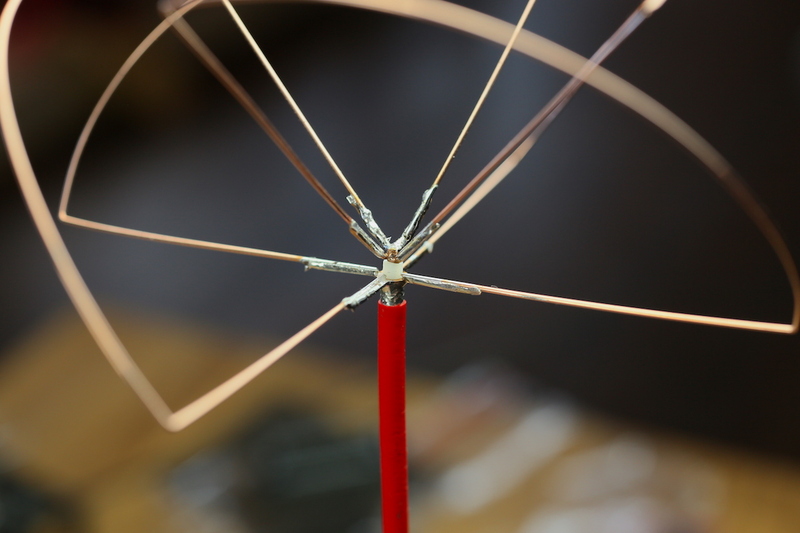 Mount the motor on the tilt top piece and then mount the whole tilt on the boom using zip-ties. Now put the top and bottom plates put together. Make sure that the wires are properly in the tracks while tightening down the screws. There should be no slop in the wires anywhere. Plugging in the wires. 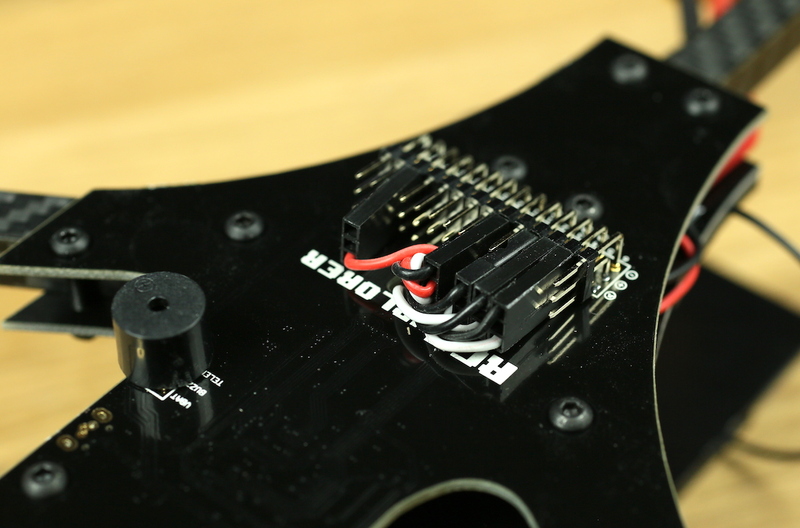 The servo feedback wire goes into receiver channel 6. Install the receiver. I’m using a long range system from Imersion RC called EZUhf. All wires soldered in place. 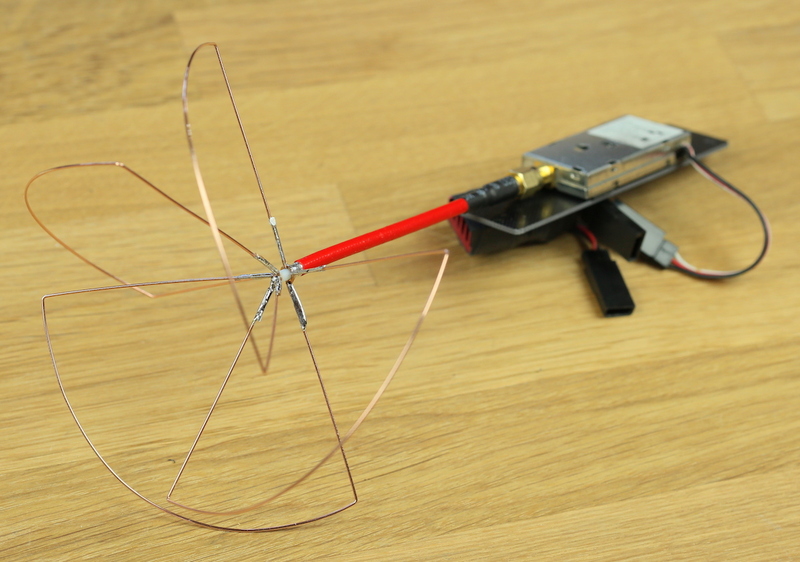 Antenna done. Going to put some paint on it. All done! Time for some beauty shots. Time for the first flight! 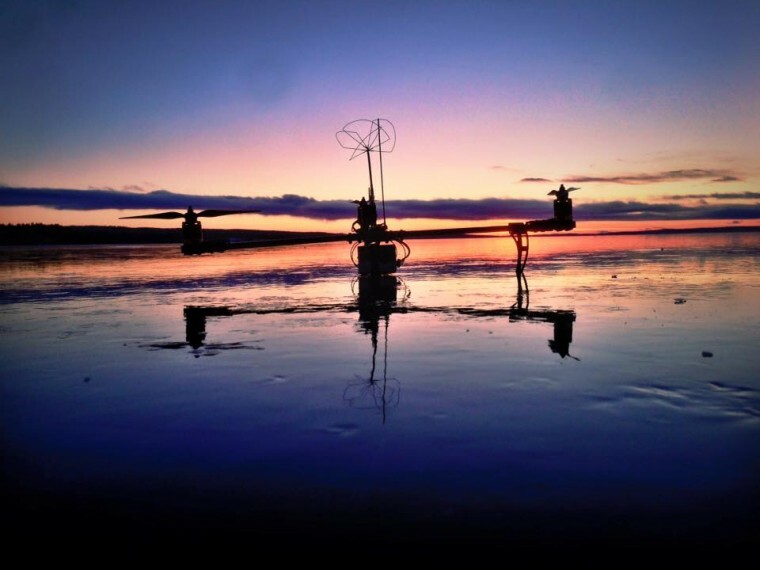 I absolutely love how this Tricopter flies. 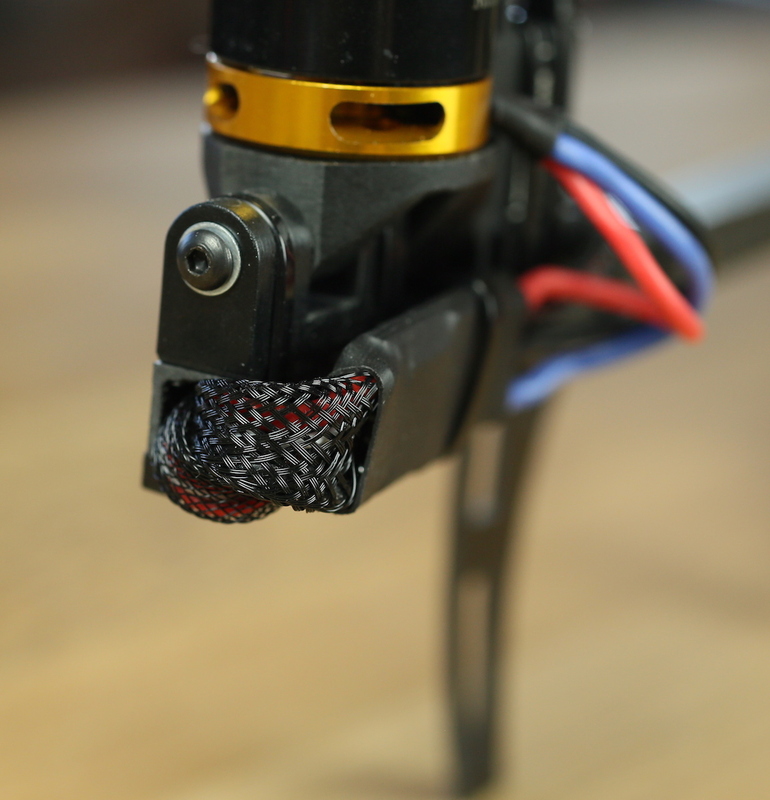 With the new TriFlight firmware it’s locked in and smooth. 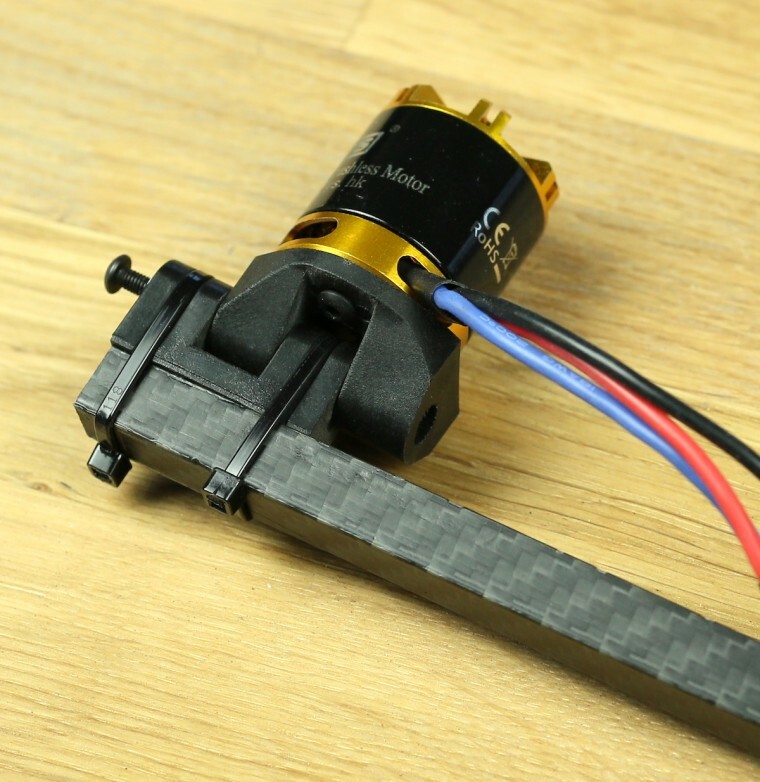 The new motors work flawlessly and have tons of power. 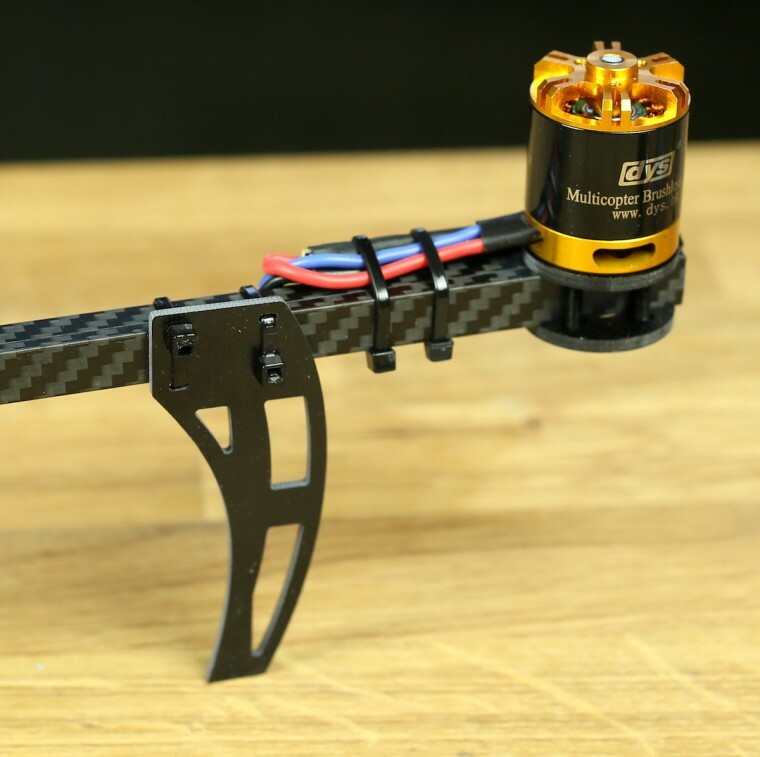 My favorite FPV platform of all time. It just doesn’t get old. Just remember to balance your props before you fly! 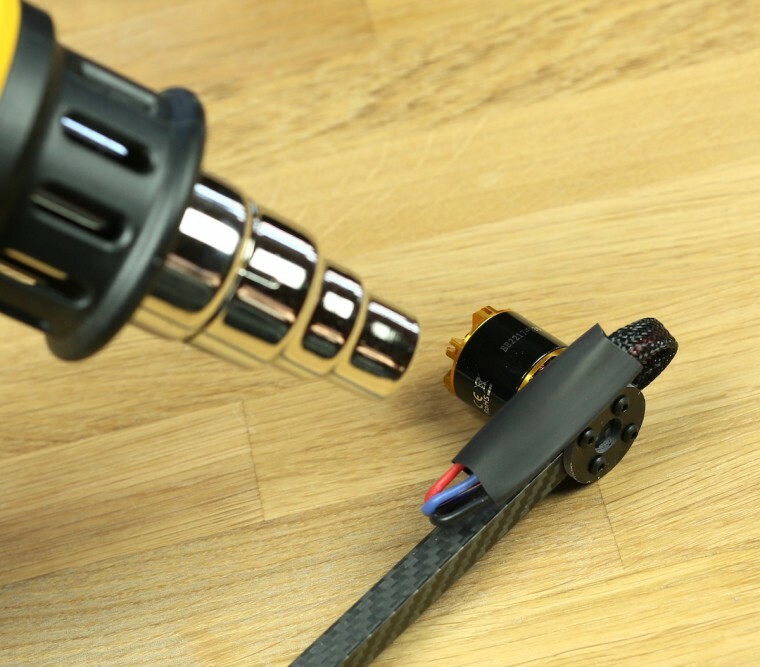 Where did you find DYS BE2217 1300Kv motors?!? Can’t seem to find specifications anywhere? They are custom made 😀 These are the sample motors. 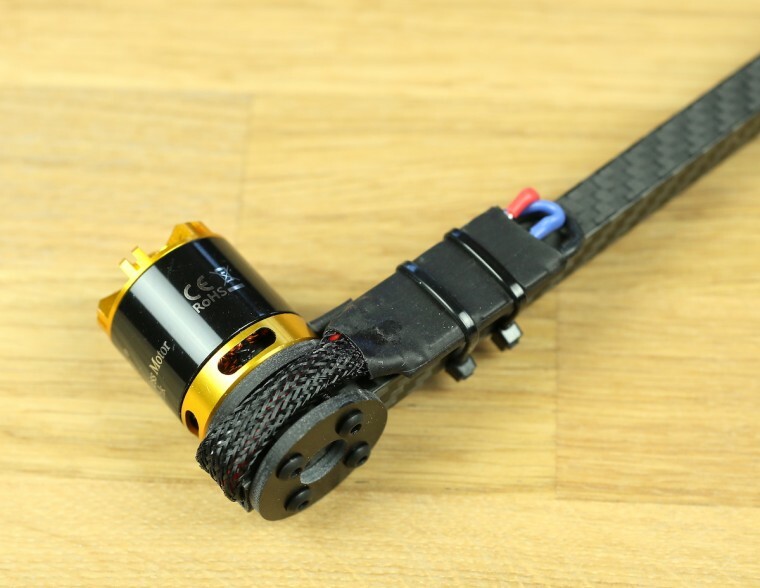 Couldn’t find any motors I liked, so I’ve had 4 different custom motors made and this motor finally hit all the specs that I was looking for 🙂 The production motors should arrive late February. Seems pretty good. 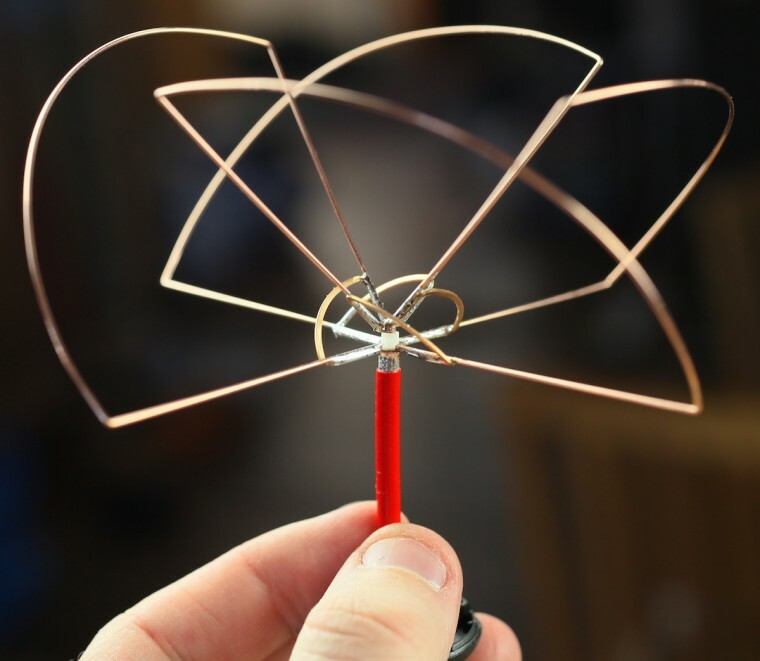 Does 100kv difference matter? 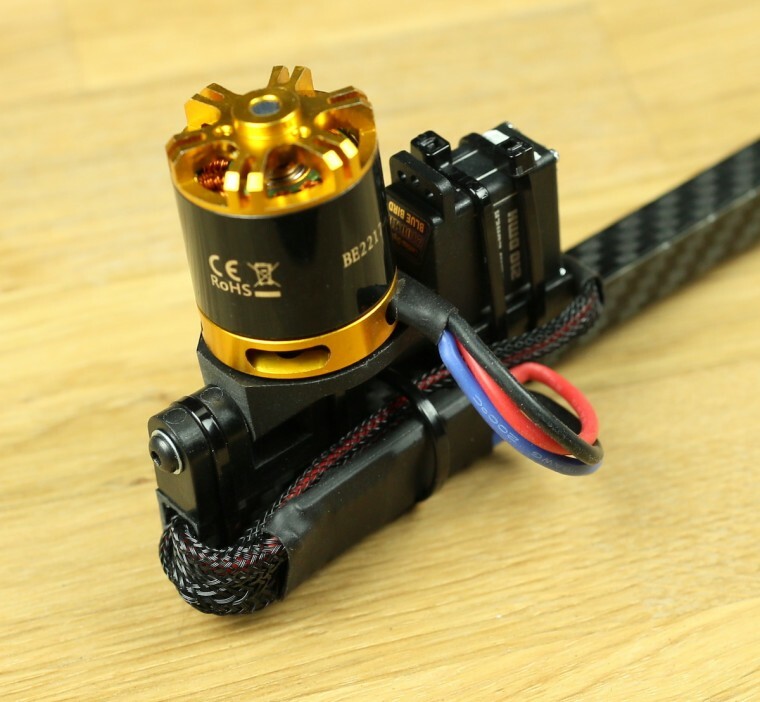 I can find many motors like you said?there are also have DYS BE2217 800Kv motors and DYS BE2217 1000Kv motors.By the way ,I am a chinese,I like this aircraft, it is special and I think it can change more better . 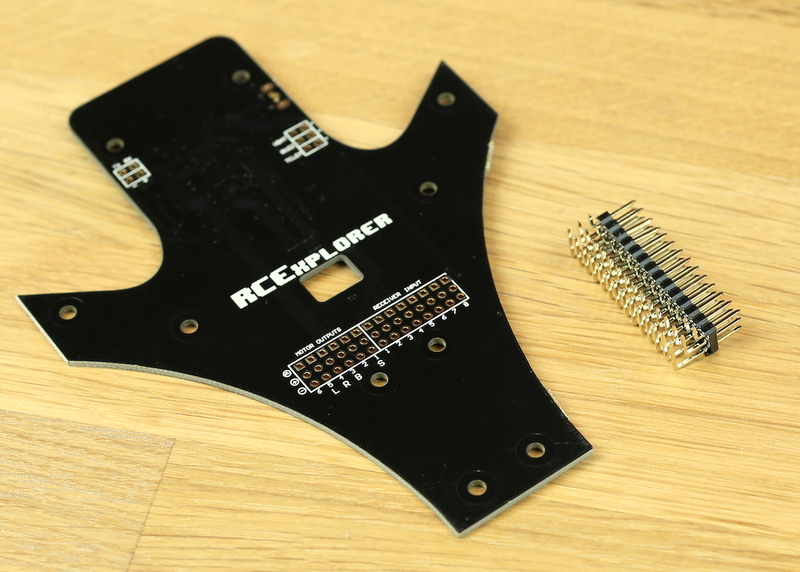 So is this a preview of a forthcoming electronics kit? Super! When can we send you money? I see you opted for little bee esc´s. Are you going to switch to them for the minitri electronic kits as well? Nice! 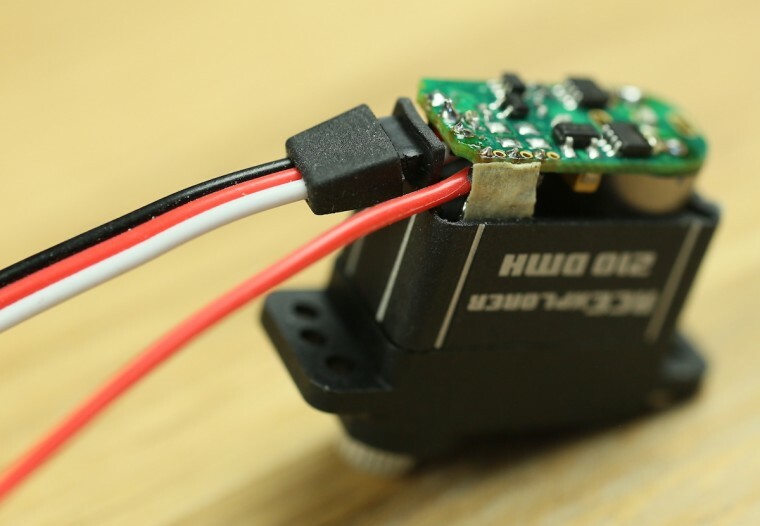 There’ll be no searching for motors once I have to replace my SunnySkys 😉 Would be very interesting to learn which parameters you tried to optimize with the new motors and how you ended up with the 1300kV variant. Doesn’t get too hot during max throttle, but isn’t too cold either. No stuttering during any throttle or rapid throttle changes. 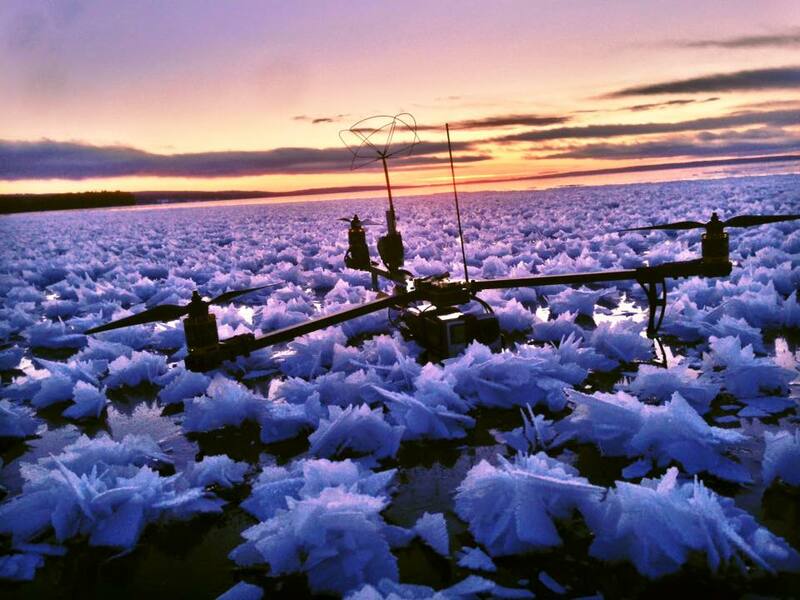 Even work with dampened light. Awesome work David! 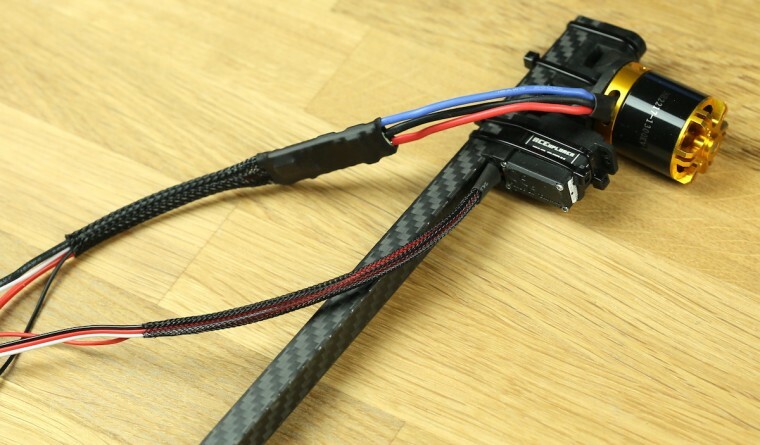 I really enyojed reading your build log and your other videos are really helpfull too! 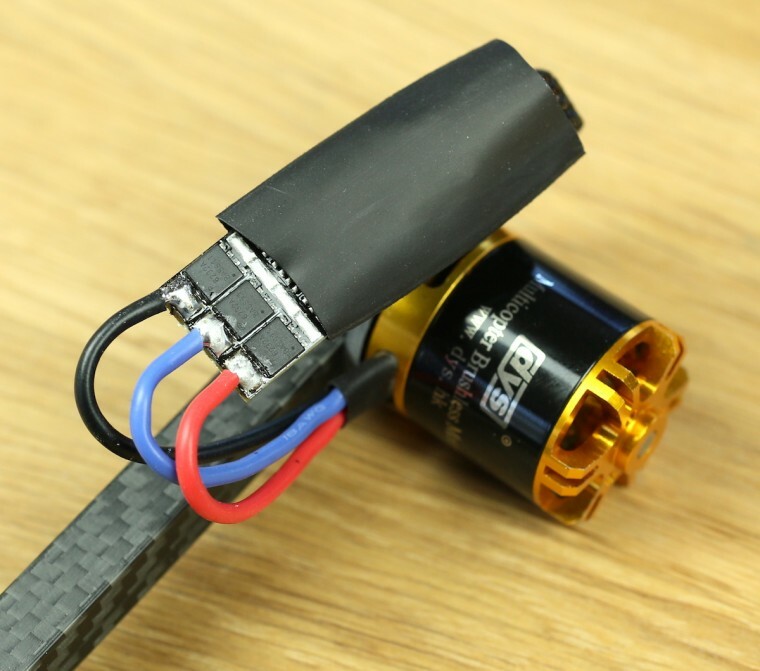 I’m currently building my third Tri and would like to optimise my motors too. 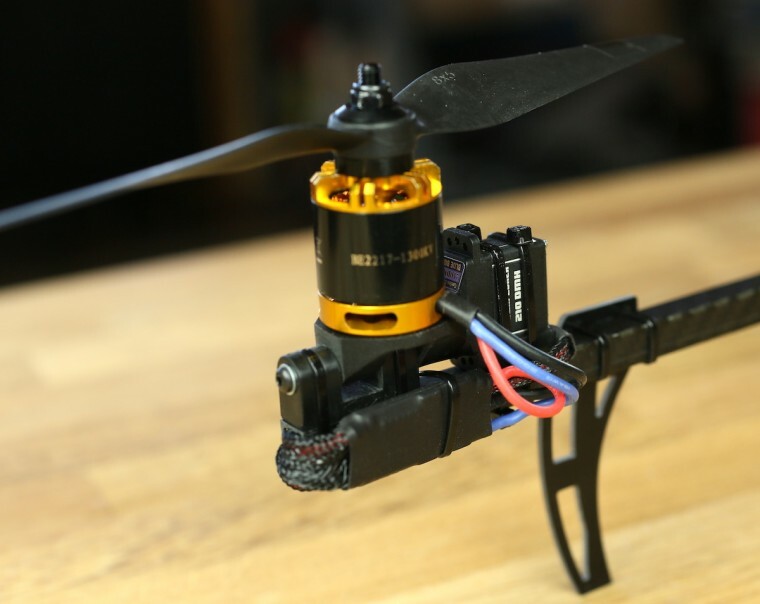 The change from KK2.0 to naze32 already showed incredibel improvements on my copter but I have the feeling that I need to work on my drivetrain in order to get it fly even better. 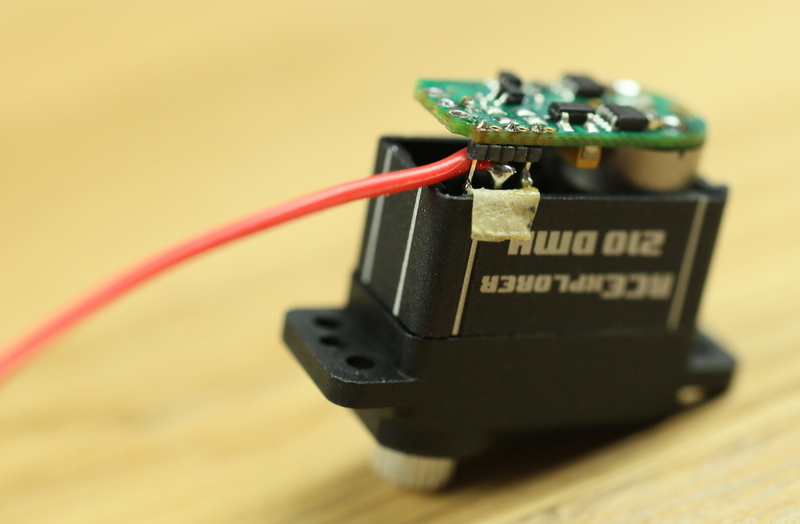 The motors that I used on the previous tris were cheap motors that now start to induce vibrations into the copter. (bad bearings, imposible to balance…) I now want to replace them with more optimized ones. In general I’d be really interested in how to optimized motors. Do you have any sources or literature on how to properly design the drivetrains? 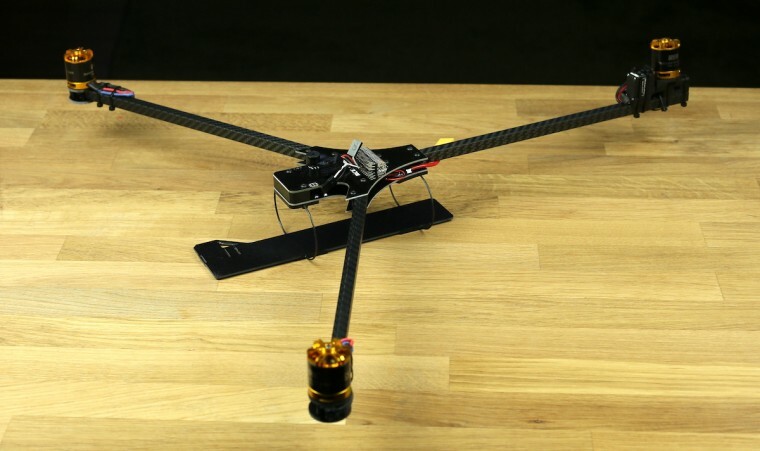 Especially on how to match prop to motor and motor to ESC for best efficiency or max thrust. I’ve been searching the net for quite a while now but I couldn’t find much on parameters and how they affect the copter. I came across a good calculator for all this ( http://www.s4a.ch/eflight/xcoptercalc.php?ecalc&lang=en ) but unfortunately they don’t show what kind of theory is behind. I would really appreciate if you could help! We love the commitment involved in having motors made to spec like you do. 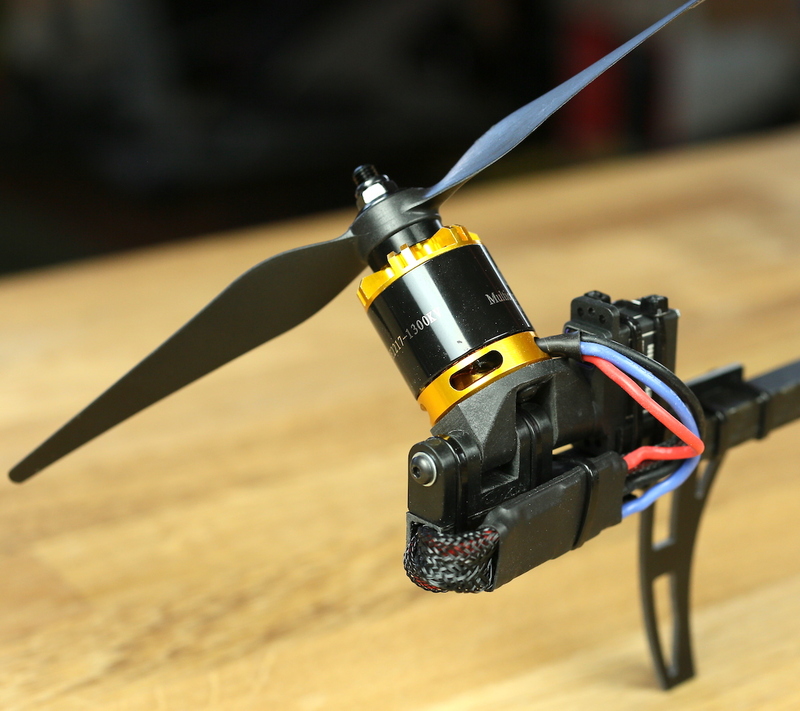 I kind of suspect that the mini tri motors are custom speed as well. I can’t quite find any other place stocking that specific blend. Nice! 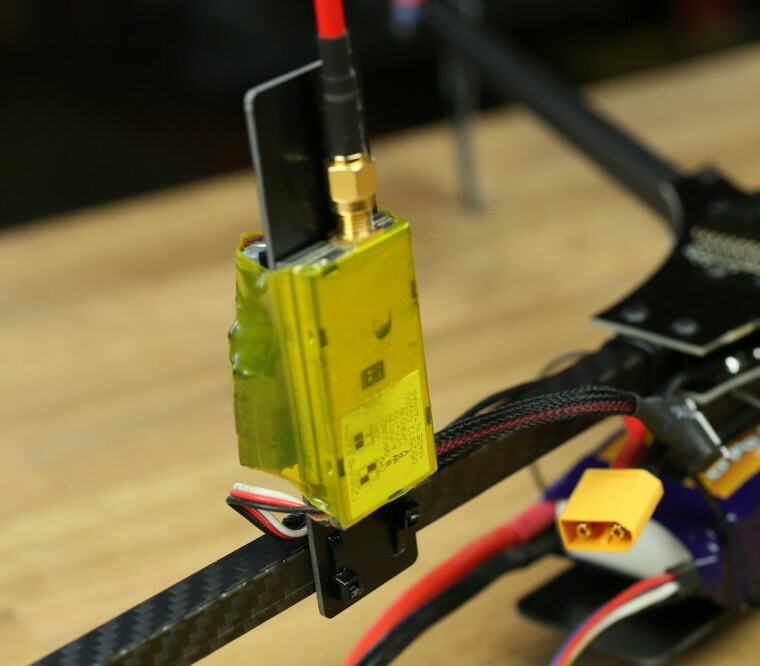 It would be better to swap the locations of the VTX and UHF-rx around though. Now the UHF receiver is listening closely to the UHF noise emitted by the GoPro and perhaps other devices around there (e.g. MinimOSD, regulators). 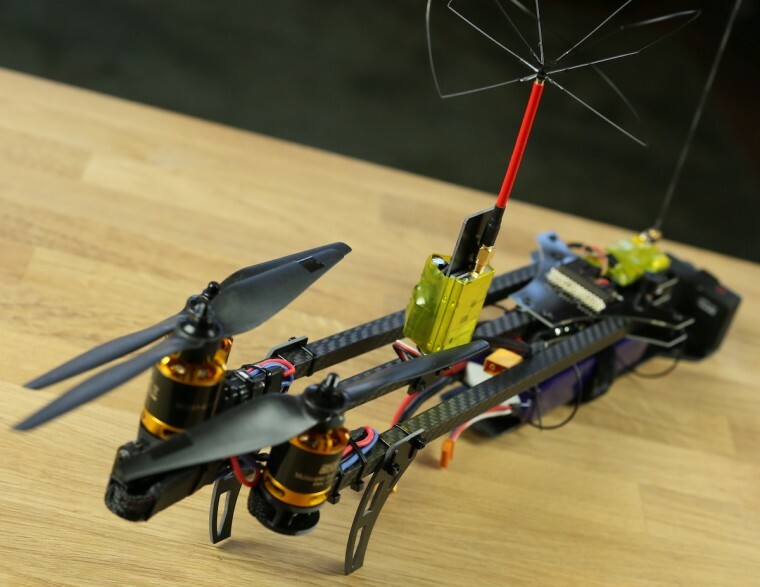 I’d like to try that flight controller and firmware, because obviously it’s targeted at best performance for a tricopter. 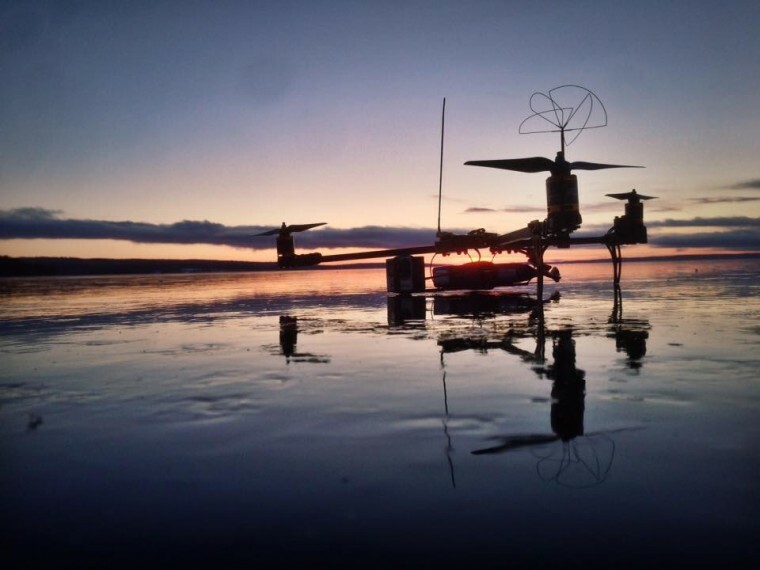 However, I also like the safety and convenience of Arducopter’s loiter and RTH modes (amongst others), especially since 90% of my flying is over salt water and to the radio range limits. If only an autopilot device for flight controllers existed. 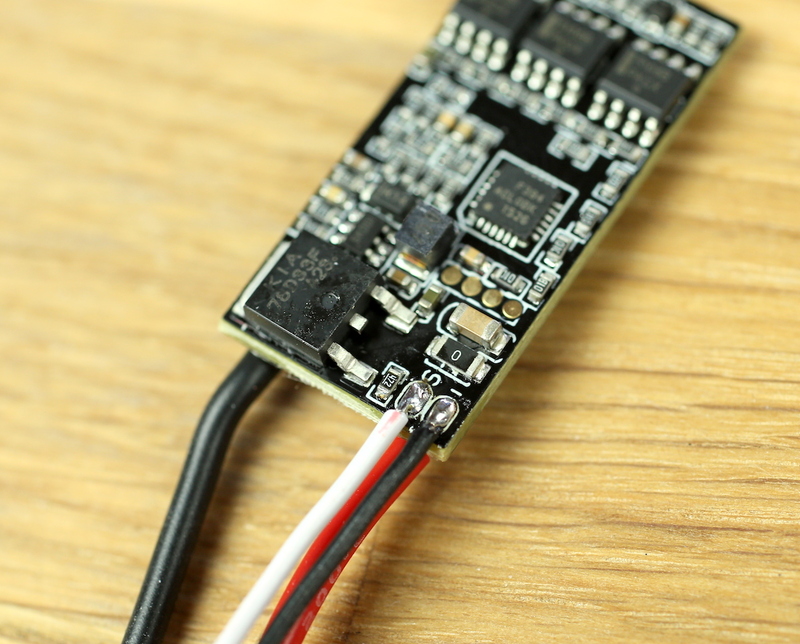 Something running firmware with all the smart features of Arducopter that merely outputs SBUS or CPPM signals that are fed into a relatively ‘dumb’ but performance oriented flight controller of choice. That would create the best of both worlds. Sounds great! I do think that all non-attitude controlling code (e.g. navigation, RTH, etc) should run off a different CPU or board so as to not have detrimental affects to the performance of the attitude controller. 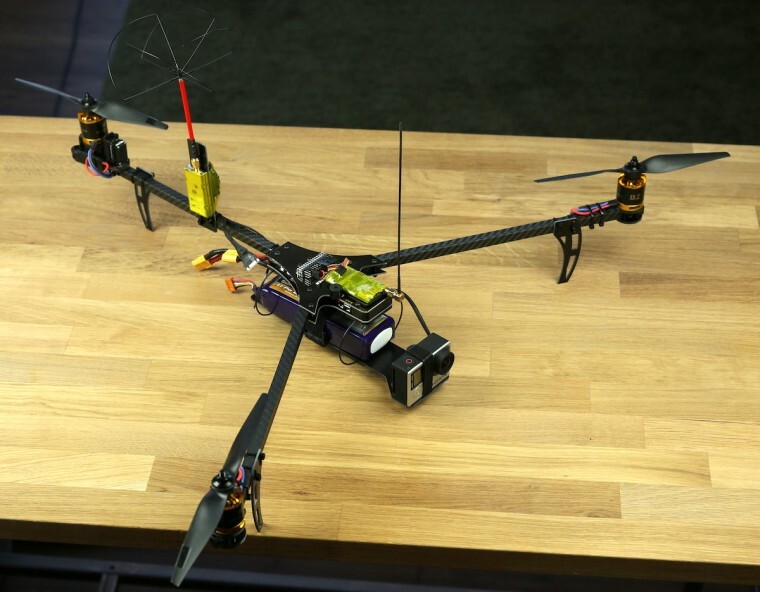 Are there going to be power packs for the large Tricopter as well? Can you specify battery used in this particular build? Flight time? And distance achieved with this UHF setup? I really like your work! Great job!!!! Flight time of around 20 minutes of calm flying. 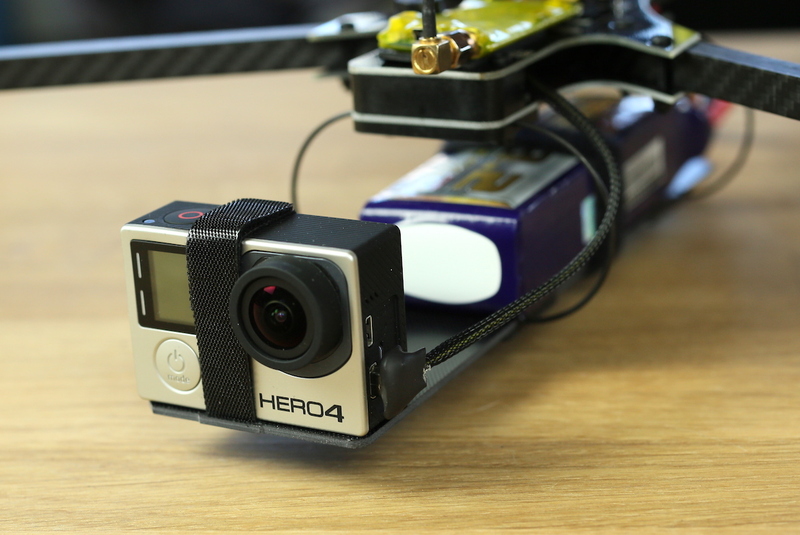 Haven’t flown more than around 2 km round trip with it yet. 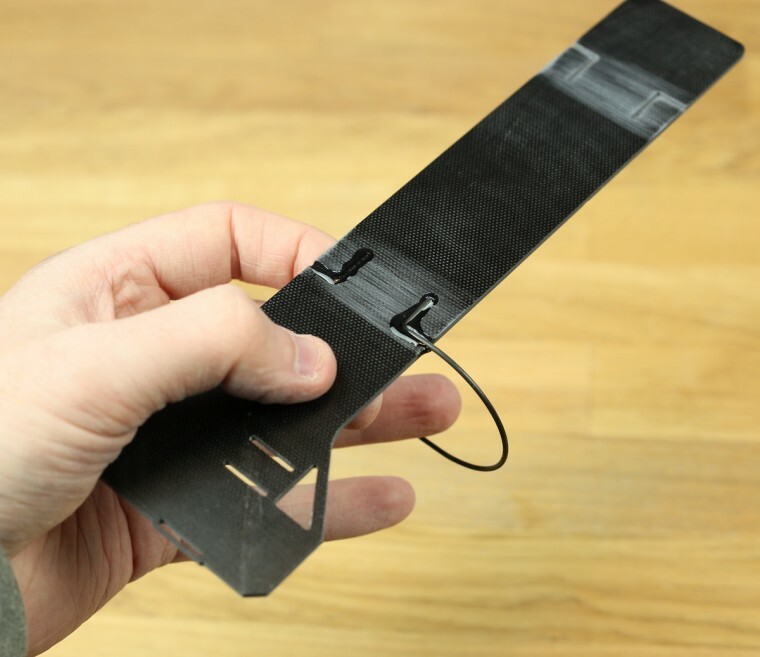 If it’s not a trade secret, I want to know what did you use to cover wires of your antenna ? What about gold plated memory wire for an antenna? 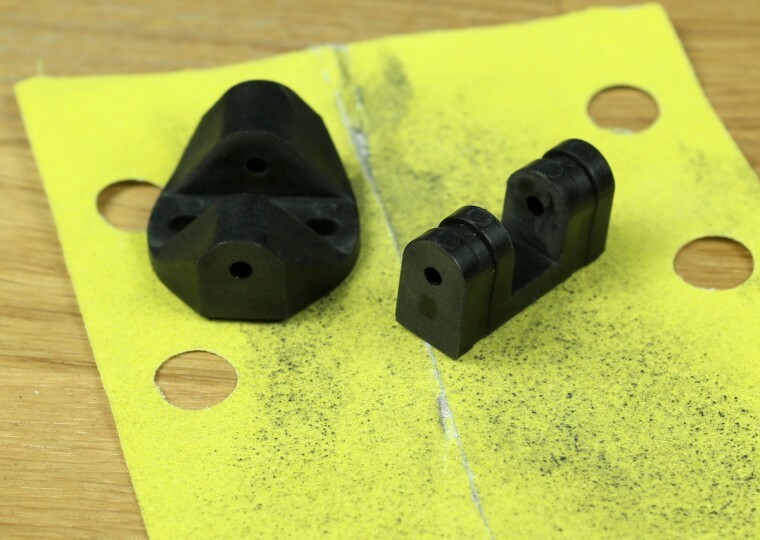 Do you have any experience with this kind of material? It looks very nice on 5.8 Ghz and are rust resistant. It’s just 0.8mm copper clad MIG welding wire. What are the advantages of this option and where to activate this ? Already find the answer in forum…. Thanks…. 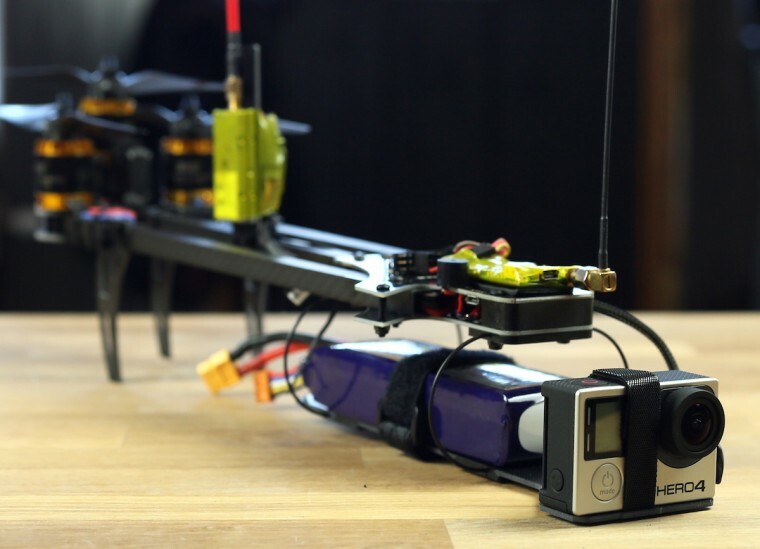 Why are you not adding a GPS and compass for your tricopter…? Beautiful build as always! 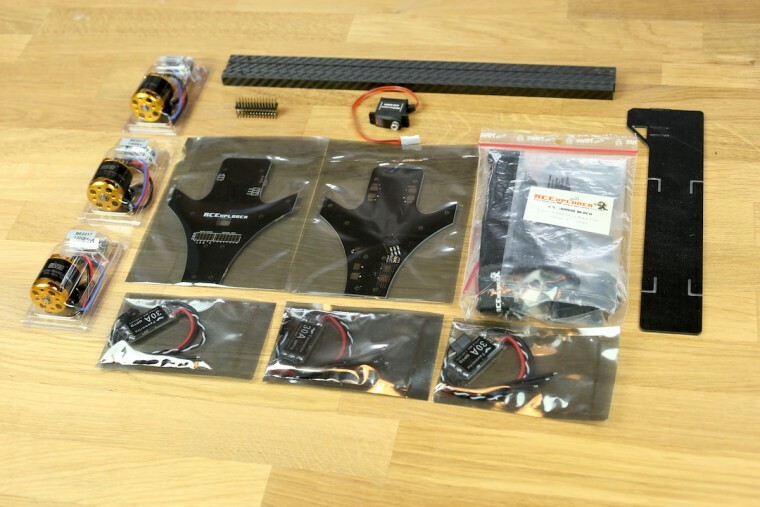 At what price should we be looking at for the electronics kit? Spanish language to document myself on the suitable setup of the tri 3.5. Do you or someone close to you know a specific forum for spanish Tricopter 3.5? electronic material. Is it true? And in this case, how much is it cost? with the tricopter3.5 you did another great job. I´m following your activities since a few years now. Thanks for all you gave to the community . 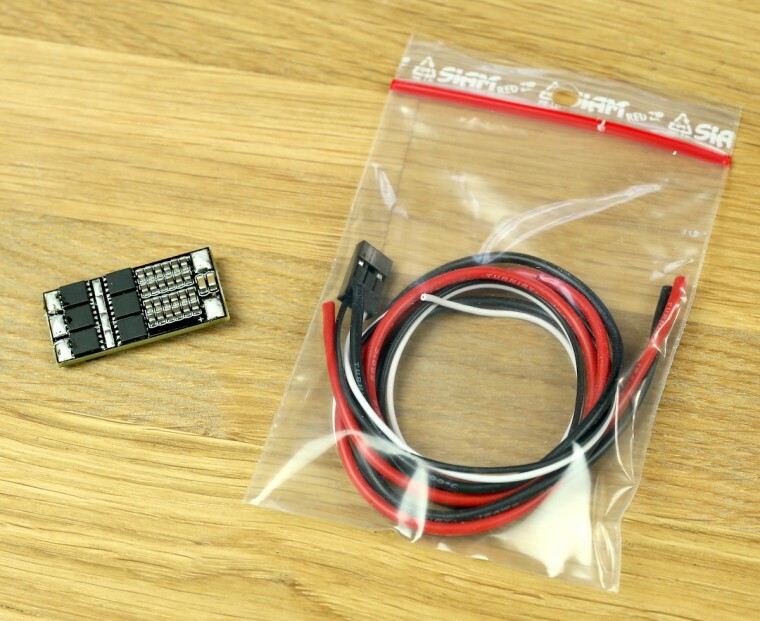 First of all – i´m a newbie to the naze32 board . On my DIY- tricopters i used KK2 and APM boards up to now. 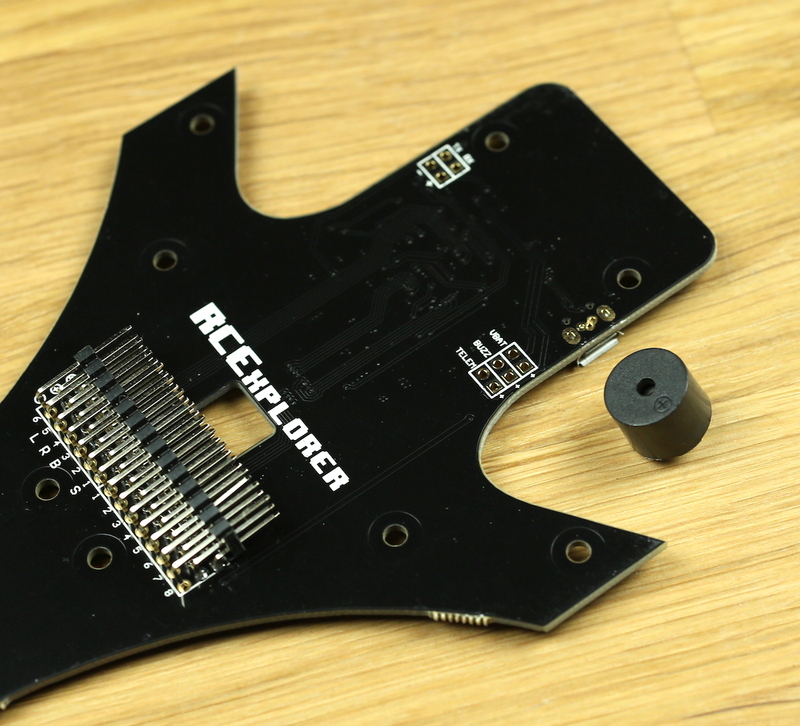 My next project will be an original rcexplorer-tricopter, as soon as the new mortors will be available. Just to see the difference 😉 . -Checking out the forum i tried to find some information about usage of GPS with your naze version and the new firmware “triflight_NAZE.hex.” Do you , or anybody else , got some experiance with that and can tell how to set it up? 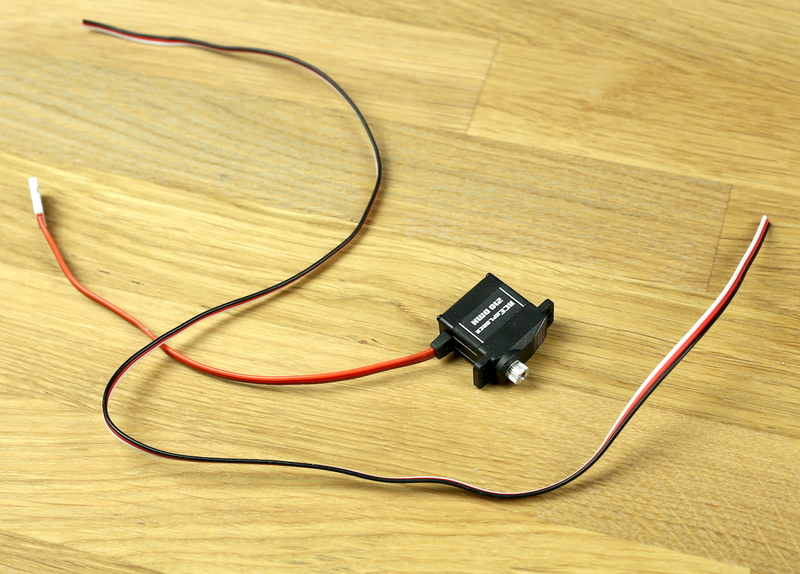 With that only 25mW we are restrictet to in Germany for use on FPV systems, it is very easy to get out of range. At least a RTL funktion is a necessary savety feature therefore. The “triflight_NAZE.hex.” is recommended only for the described tricopter hardware. 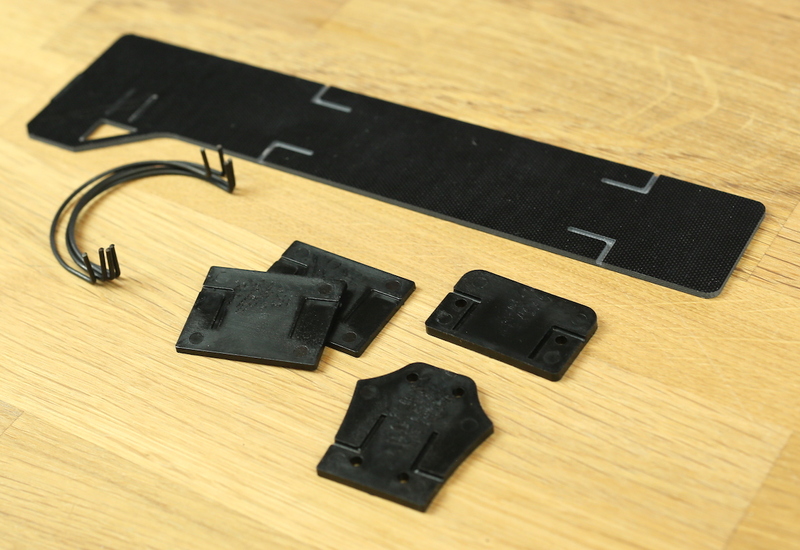 The newer naze boards are equiped with barometric and magnetic sensors. Would the firmware work with and/or support these features. I guess not, just want to make sure by the experts. Did you or anybody else test this out yet? I might be able to help out with some information about the board and the possibility of adding GPS. 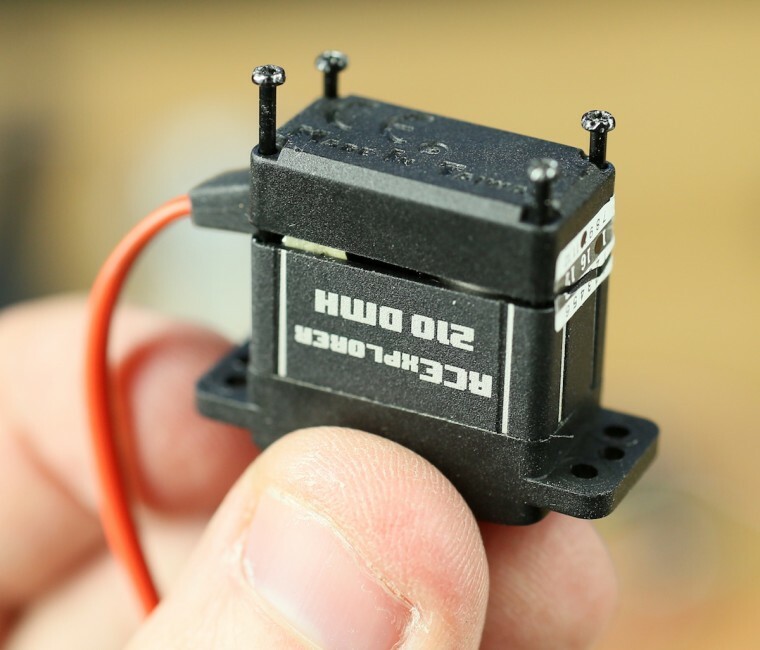 First of all the electronics on the tricopter naze32 are the same as on a naze32 acro. This also means that compared to a naze32 full, baro and magnetometer are missing. 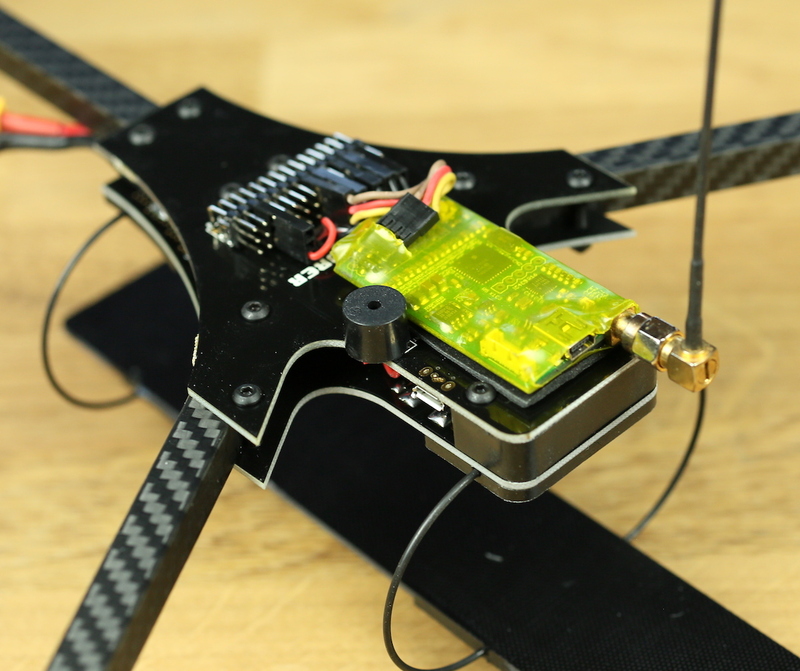 I myself am fairly new to the naze32 board too but so far I managed to add a baro, Hott telemetry and bluetooth to the tricopter board. So far I’m pretty confident that all features will work with the firmware! I was actually very suprised to see how easy it was to add the baro. 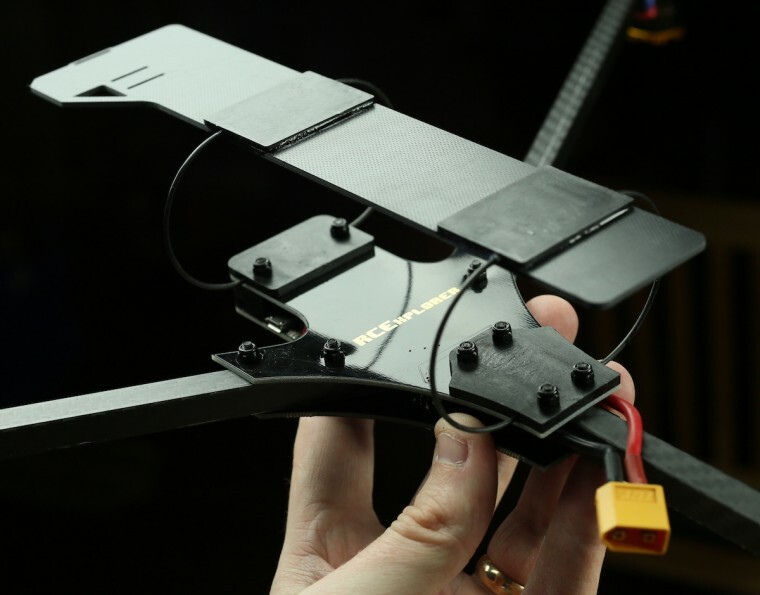 For me it was just soldering it on and it immediately showed up in the cleanflight configurator. Hott telemetry and bluetooth were a bit more complicated for me but I got them to work eventually. thanks for your reply. 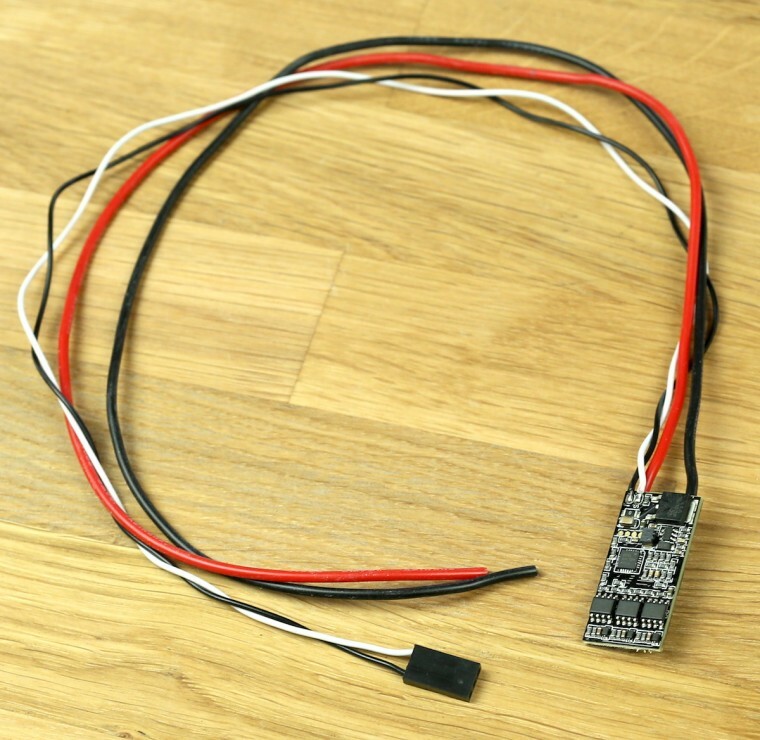 Since i wrote this comment i received a (Acro Afro Naze32 NAZER 32 10DOF Flight Controller w/ Barometer & Compass) from Ebay. Quick mouted it on my DIY Acro Tri to test it out on a prooven frame. 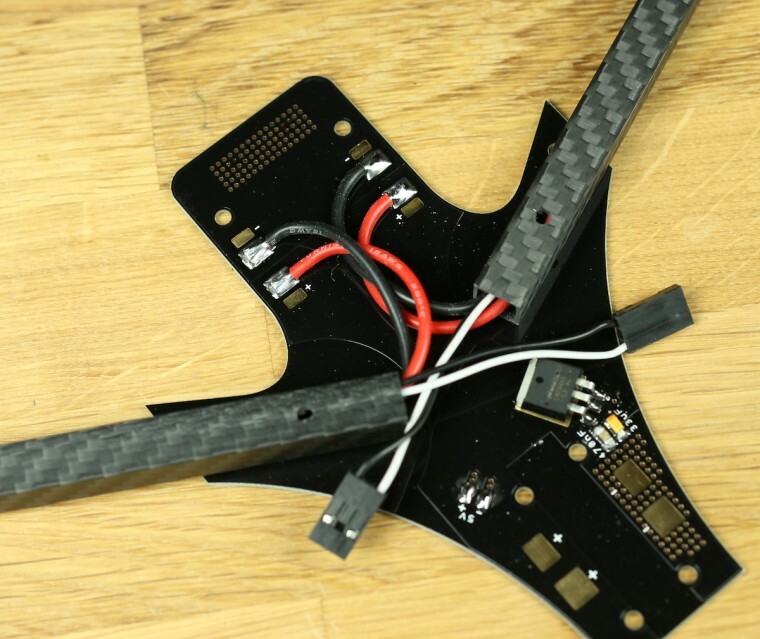 First i used a normal tricopter firmware which was offered from Cleanflight and set up the Servo and all other necessary adjustments. After some try and error i could even setup a GPS until it got a 3D fix. The Painless 360 videos where very helpfull. 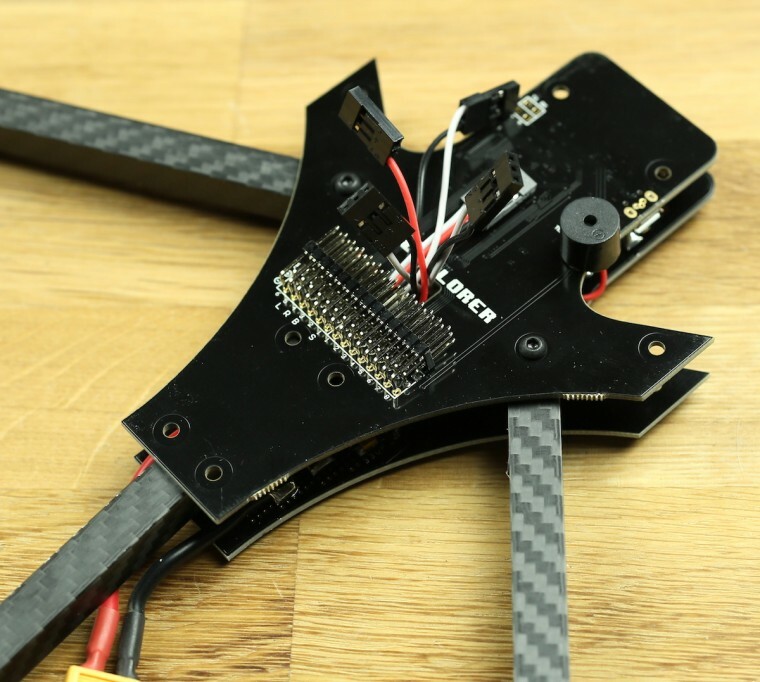 🙂 for the basics, but he doesn´t setup a tricoper? The problem started when is tried to fly with this. 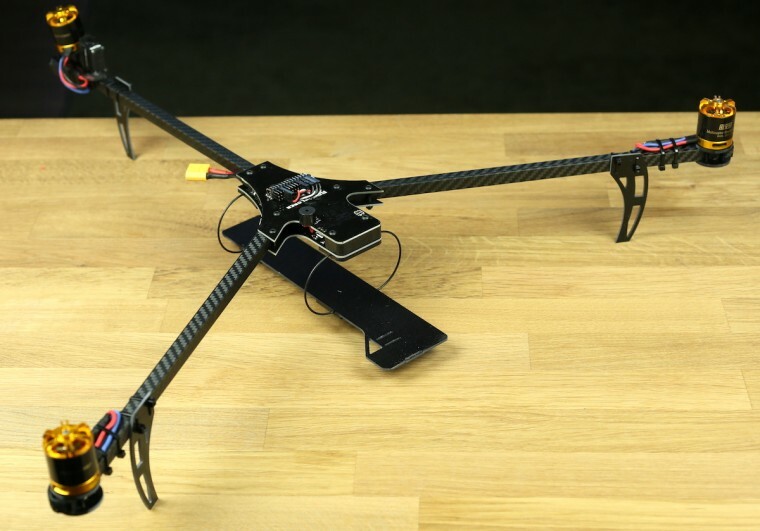 It flew terrible , was almost not able to control it. No thought to test any electronic gimmiks. Bit desillusioned i went back to the workshop. Before stepping deeply into PID adjustments , i decided to test the “triflight_NAZE.hex.”firmware from David and Laucha and flashed it. The test flight with this was just great even without the recommended hardware and the recommended servo feedback. Very good control and high agility. Almost the same as i experianced with the kk2 board. Now i started again setting up the GPS adjustments in cleanflight. Even with everything setup right, the GPS did not show up in the top bar of Cleanflight screen. As far as i know by now, it is just not possible to use a GPS with this firmware. I´d be glad if sombody would tell me lies and can show up how it works. But im not sure if the nut doesnt losen itself in mid-air?…. With lock nuts the props don’t come loose. I would never recommend using anything but a lock nut. 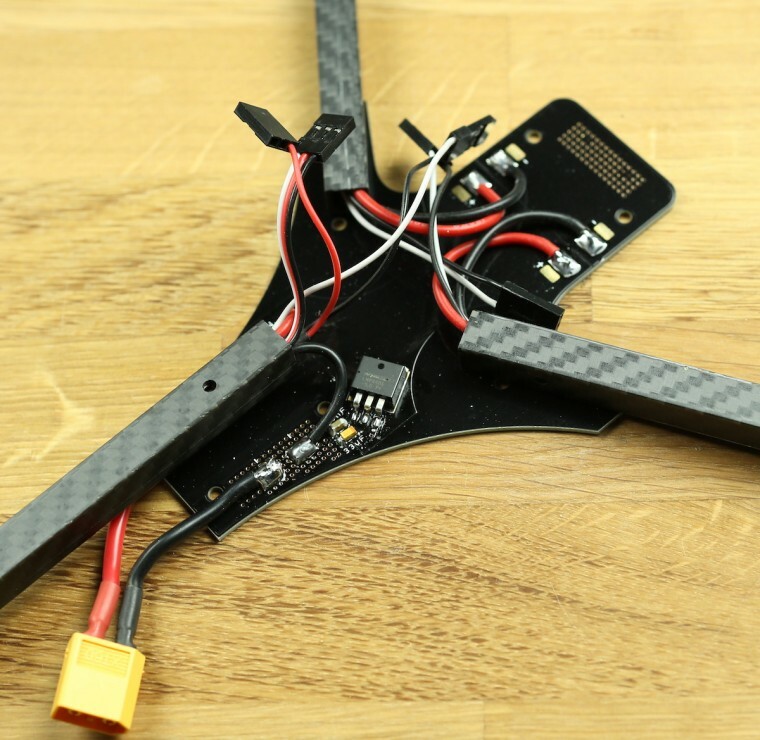 Today the ESC’s use a feature where they slow down the props very hard, which unscrews the nut if you have tighten the other way anyways. Just use a strong lock nut and you’ll be fine. David are we still looking good for v3.5 electronics kit in the shop by the end of the month? There have been some delays with the motors, it now seems as if they’ll arrive here on the 29th, so it’ll be the beginning of March instead. That’s great! I figured it would be worse than that with Chinese new year and all. I wait with money in hand ready to throw at you! 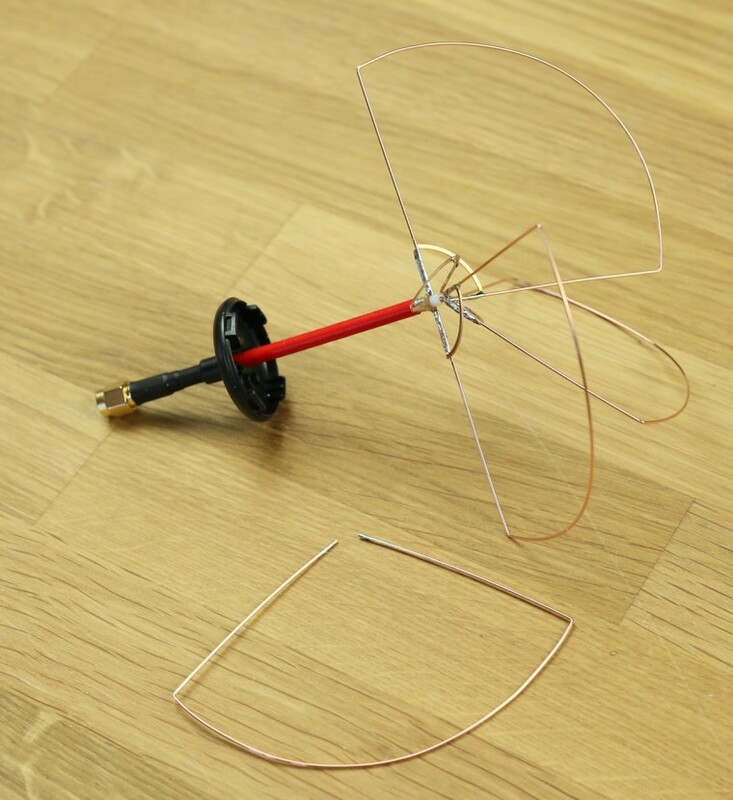 Hi David, strange request but what did you wrap your vtx and receiver in? I have been looking for translucent coloured heat shrink and cannot find a good supplier. Thanks, and congratulations on your continued improvement and innovation to a great multi rotor platform! How much does it weight without camera and battery? I was wondering around the carbon fibre arms, but I don’t know if this arms weight less then aluminium arms. 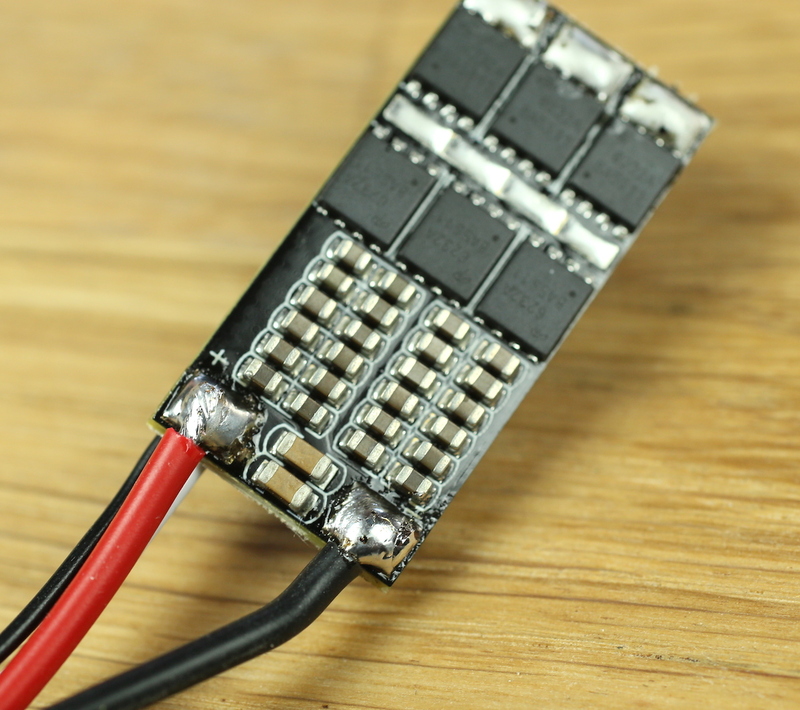 This build doesn’t include a step for running power lines from the power distribution board (if using) to the Naze32 board. So, after completing the build I discovered this and had to rip the thing apart to run those lines. Grrrrrrrrrrrrrrrrrrrrrrrrrrr. Yep I did exactly the same thing GGGrrrrrrrr. my Problem Is I have the Optima 9 receiver but also want to run the servo feedback wire into channel 6 but the way that David suggests to just connect the signal pins, I cannot. Any ideas? David Please Help me its giving me a massive headache. 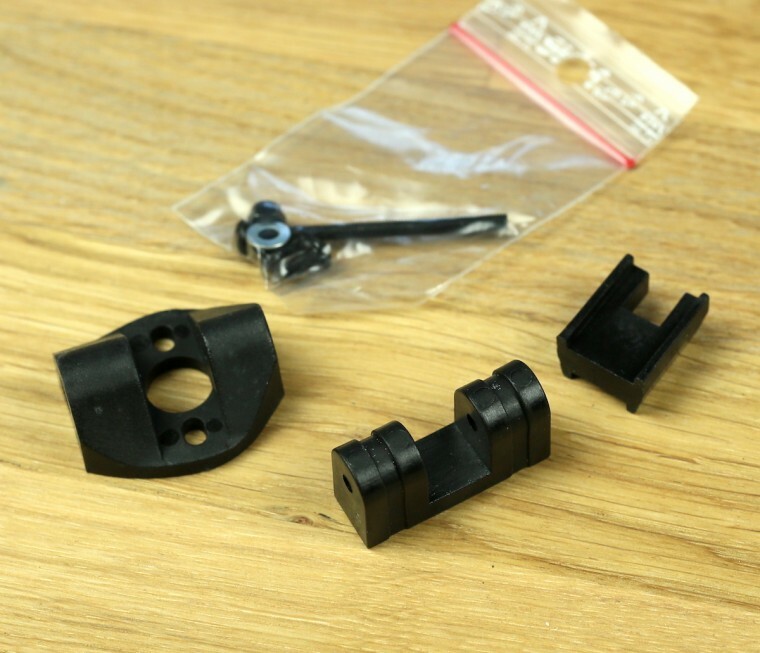 David – I bought a 3.5 kit some time ago and life got in the way. I was to the NAZE32 programming when other things “happened”. 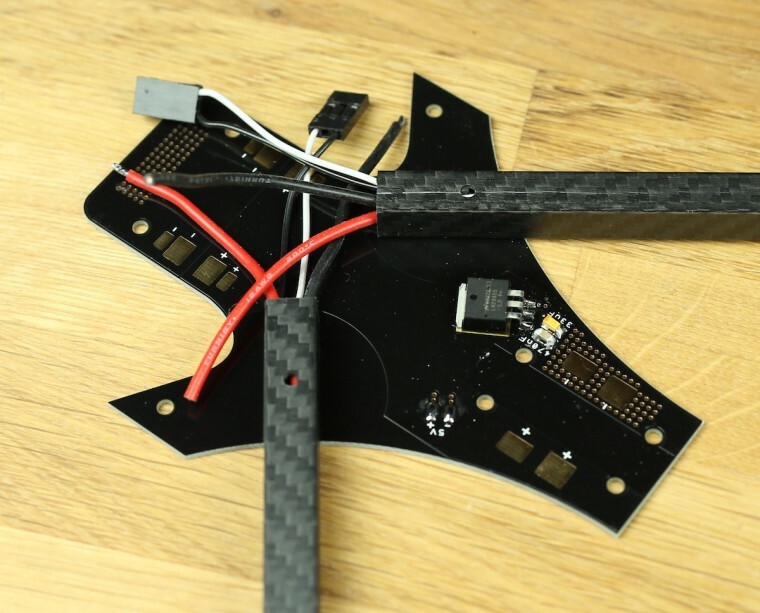 Anyway, I would like to complete this and get it flying only I reflashed to the latest hex for this board and now the RX inputs (PWM) are not registering on cleanflight. Any ideas? I don’t even know if you check these older pages. Yes, tried that version as well. I should have updated late last night. I found that my RX had a bad channel (Orange RX). I guess I should just buy a better RX next time around. I have read that it needs the first 4 channels working before it will work at all. So to the next issue. This is a learning experiment just like any other flight computer. 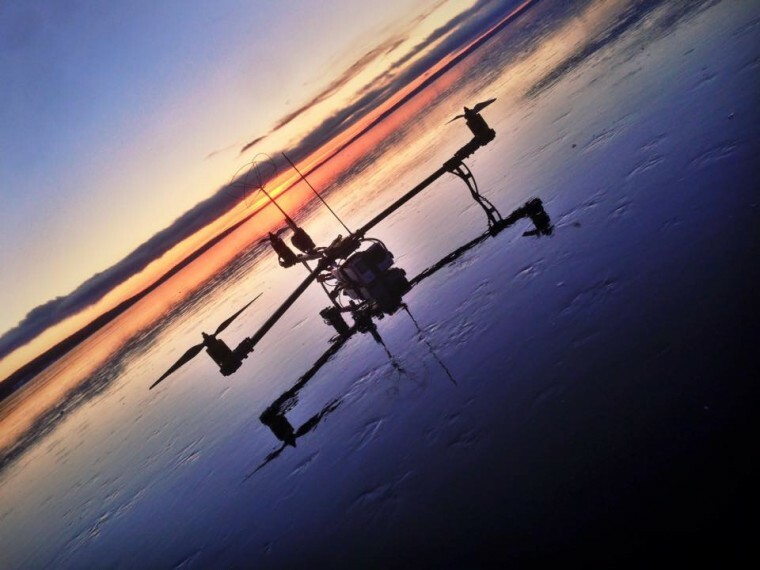 I only have experience now with a couple of collective pitch single rotor heli computers having only just upgraded from flybars about 6 months ago. 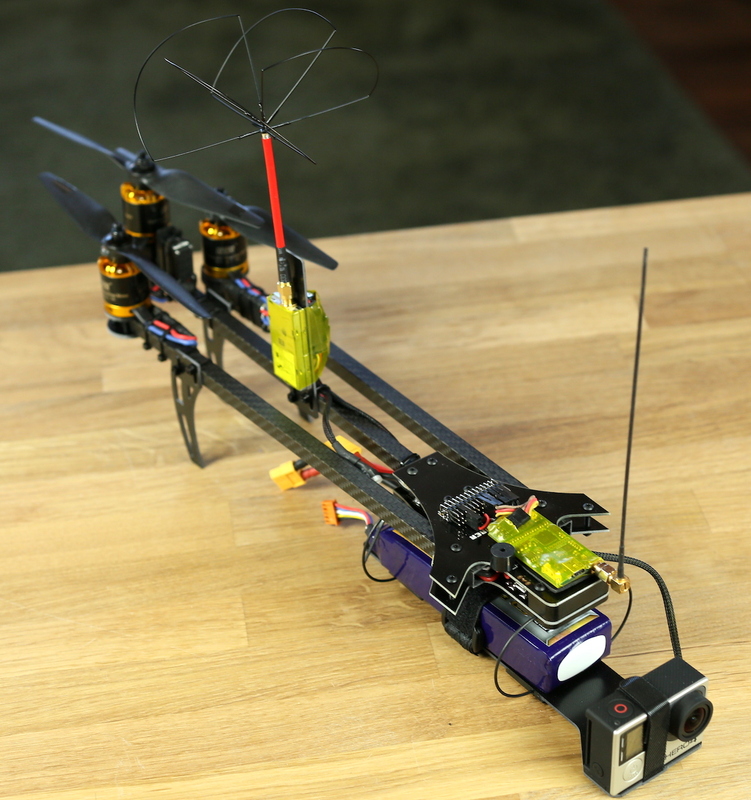 An update – I got it to arm, but only get response on the servo. NAZE claims the motors are armed, but no movement (and the ESCs are calibrated). Looked up possible reasons and someone said to check the task list. gyro/pid is showing maxload of 88.9% and avgload of 67.9%. This may be a problem. Also noticed problems with the comm port throwing odd characters. seems it can’t keep up with the comms speed or something.